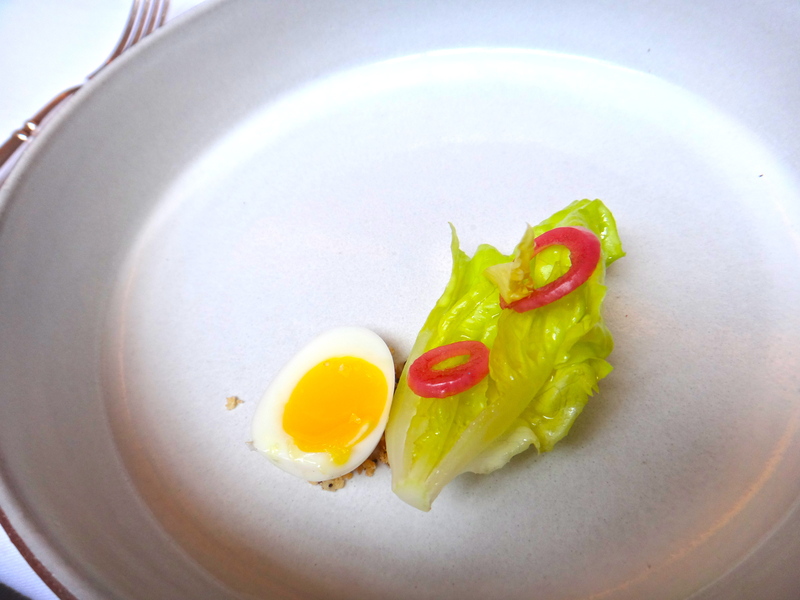 We had been planning an epic meal at a three Michelin star restaurant in NY for ages and after much debating and perusing on ramblingsandgamblings.blogspot.com who apparently dines at these establishments on the reg we decided on Eleven Madison Park. 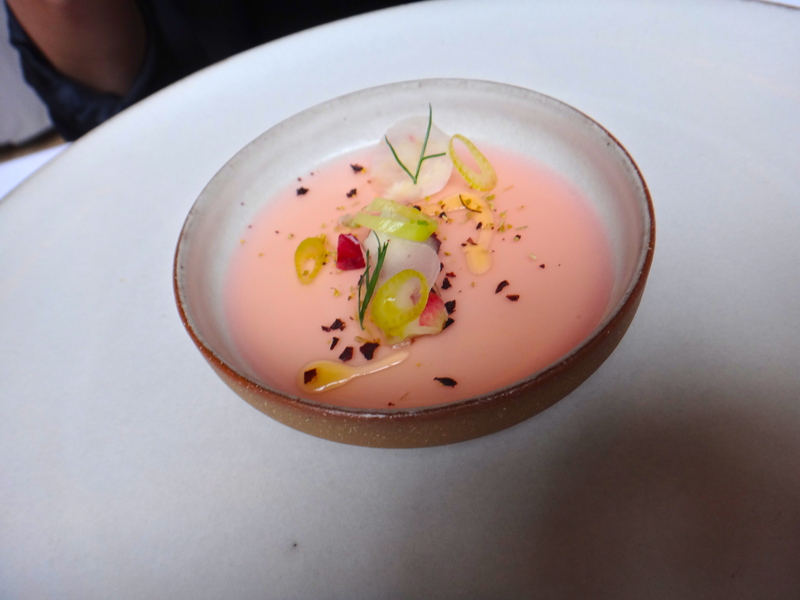 Seriously though if you want to look at thorough reviews of NY restaurants this is a great blog, this guy eats everrrryywhereee. 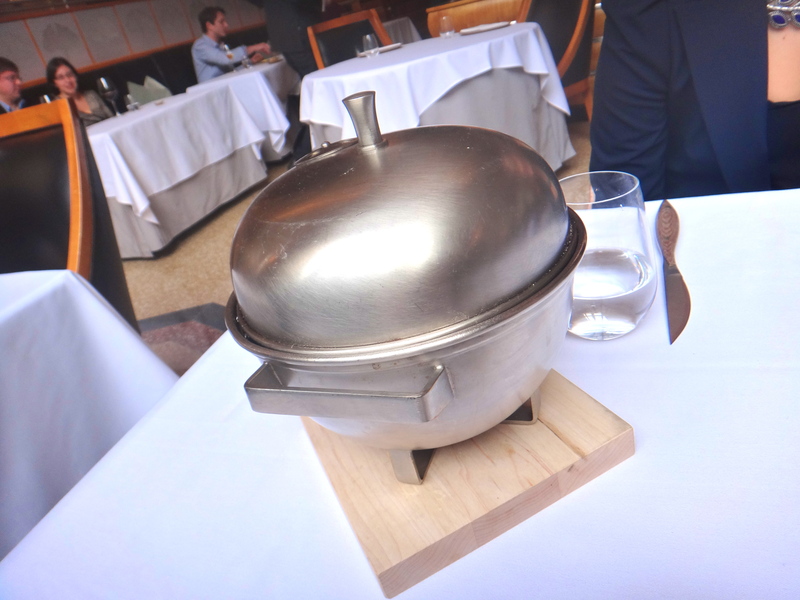 Although Per Se is more well-known, it was more expensive with fewer courses and a lot of the more interesting or ‘fancy’ courses like the foie gras, the caviar and the Japanese Wagyu are supplements. And not $20 dollar supplements, $40-100 dollar supplements which on top of a $310 price tag (albeit service included) is a little hefty. 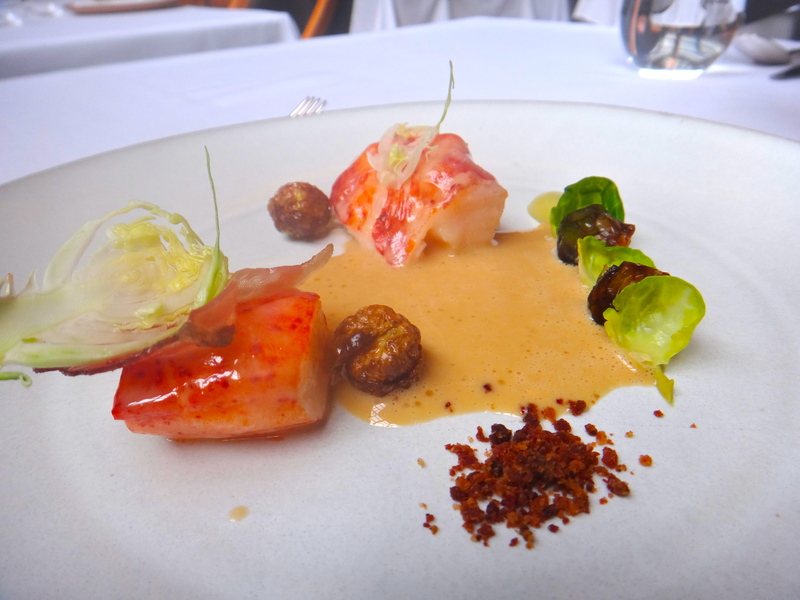 Le Bernardin is too seafood focused for us, Daniel did not impress as much and Brooklyn Fare is impossible to get a reservation at + a little too molecular gastronomy-esque for us. So EMP it was. 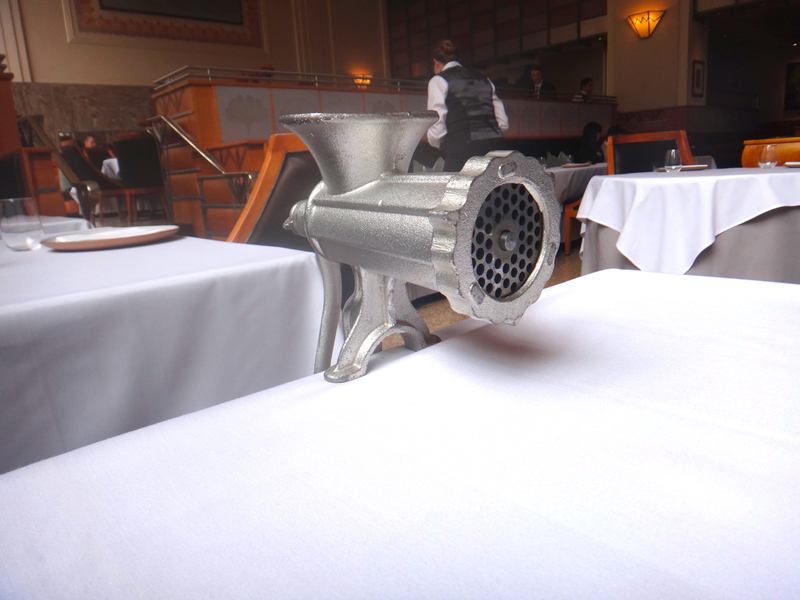 Plus we hear there’s smoke and magic tricks at EMP and we are easily swayed by such trickery. EMP is unique too in that there is not a set menu (although naturally they do have their stand by dishes) and you can tell them what you like and don’t like so that you won’t be eating any courses that you dislike. 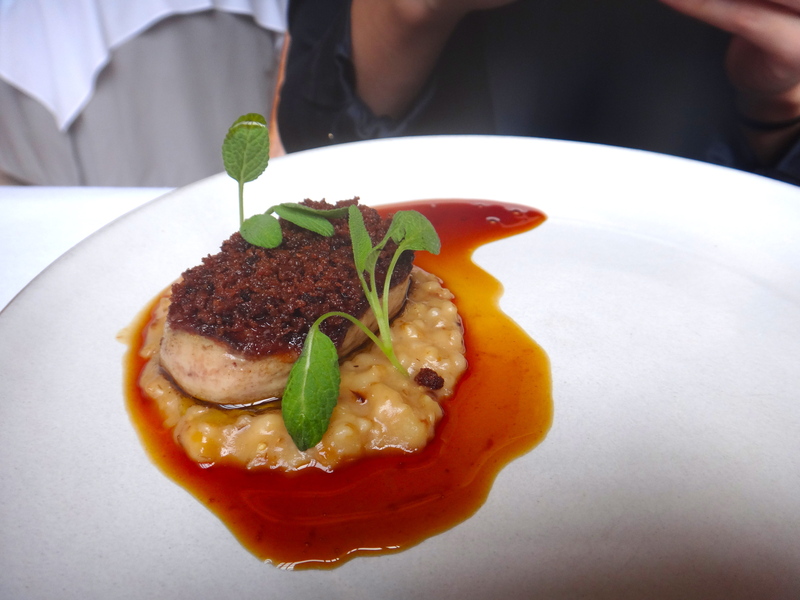 For me that was no offal except for foie gras and for my sister it was no shellfish. Included all the courses from both our meals (mine first and my sisters second) as they could be pretty different. Note that there might be mistakes in identifying all the components of each plate as this meal was from a couple months ago but I think it should be generally correct. Black and White Savoury Cookies and Iphone 4. Kidding, who even has an Iphone 4 anymore (I do). 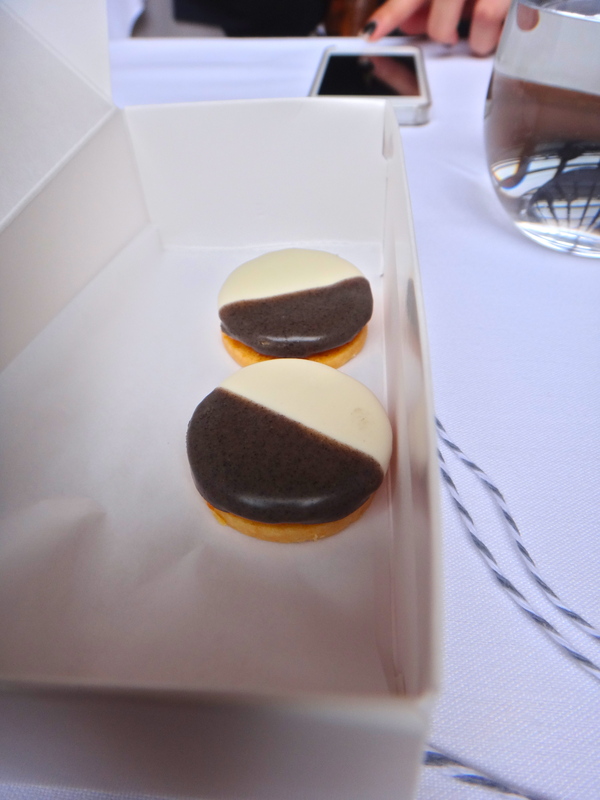 A nod to black & white cookies being a NY staple these were a savoury cheddar version that came with apple and the black tint from vegetable ash. Pretty tasty and I love pairing cheese and fruit. I heard the old version was parmesan and truffle though which might have been even better. Both of these were great. Cannot for the life of me remember what made my granita so purple. 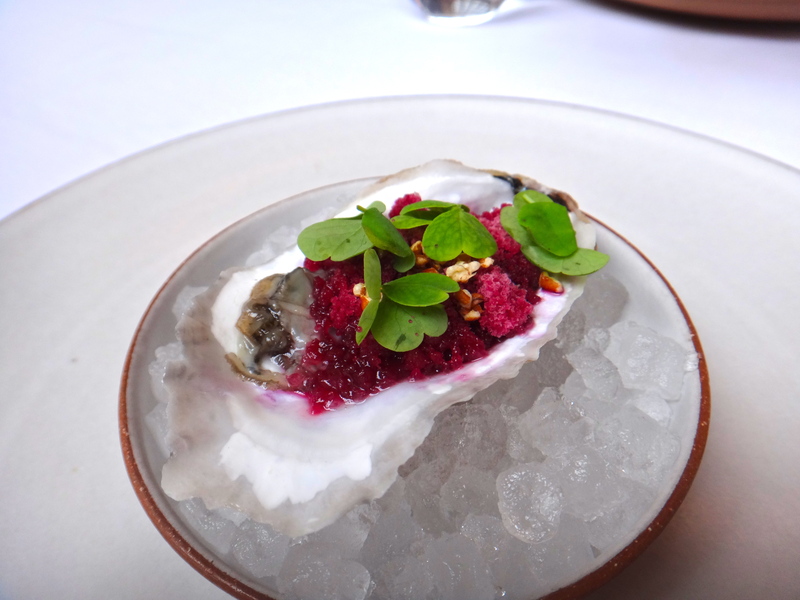 And although I love oysters I tried some of the panna cotta and together with the rhubarb have to admit it was a very nice contrast of creamy with slightly tart. Same for both of us. We were really concerned this was going to be overly fishy but it was SO GOOD. So creamy and the chive oil at the bottom makes this taste unbelievable. Really nice combination of flavours that initially I did not think I was going to love. One of my favorites. Same for both of us as well. 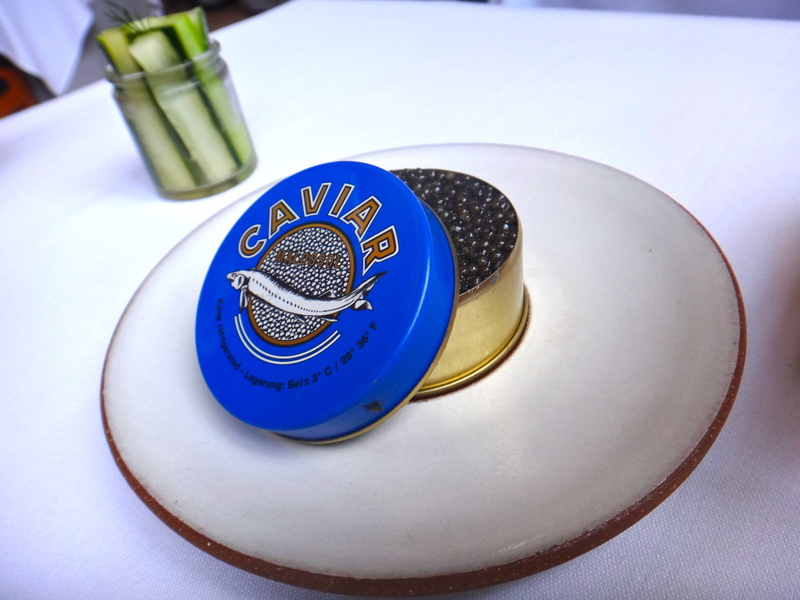 If you are like me you got super excited at that fat tin of caviar. However sorry to disappoint, although it is a very decent caviar portion, it is only one layer and beneath that its all cream cheese. 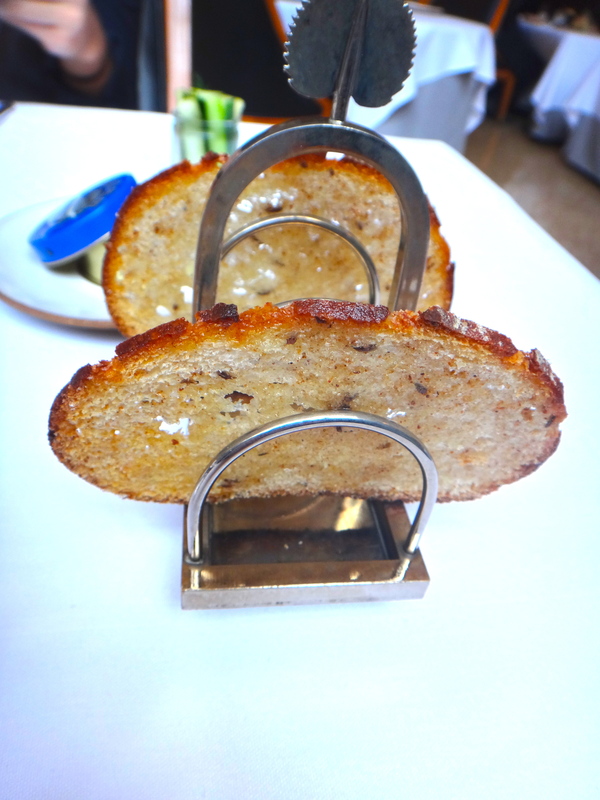 The bread is thinly sliced and crisp and you can eat the sturgeon on the crisp with cream cheese and caviar or with the quail egg salad. Or all together like I did. Pickles were also quite nice but nothing out of this world. Sadly no pictures of them removing the glass dome filled with smoke over the sturgeon. 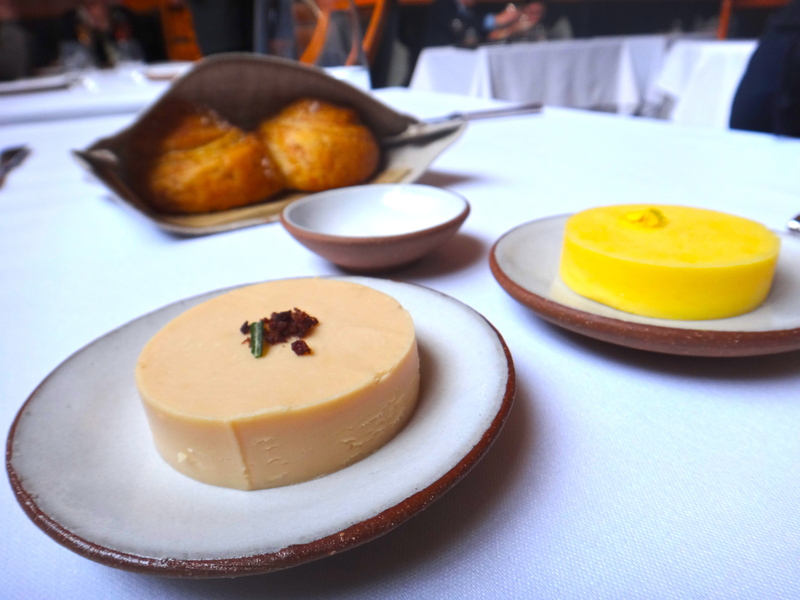 For the meat courses you can pick a lavender duck or the venison, we went with the venison so venison fat was mixed into the butter for our Bread and Butter course. So GOOD. I wish you could buy this at the grocery store because beef-fat butter is amazing on everything. THe bread is also divine. 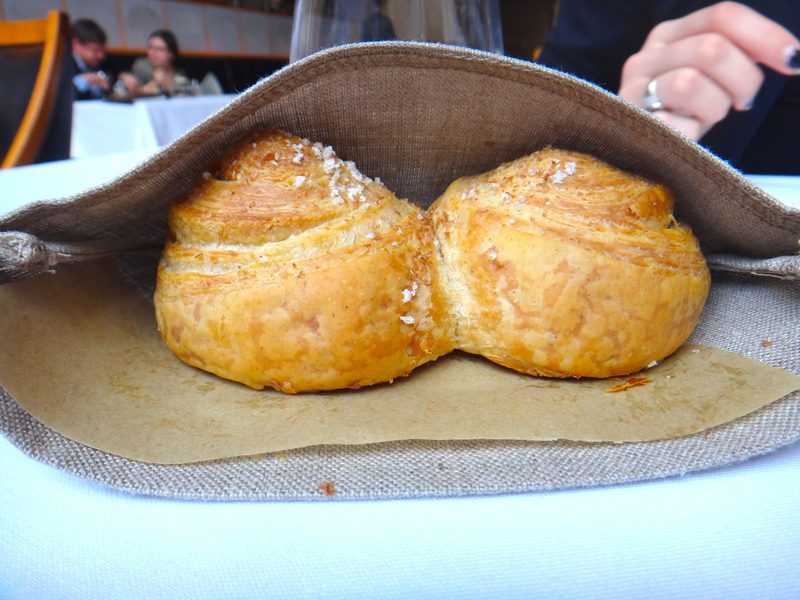 I’m not a huge fan of puff pastry or croissants but this had the perfect balance of real bread chew and flakiness. 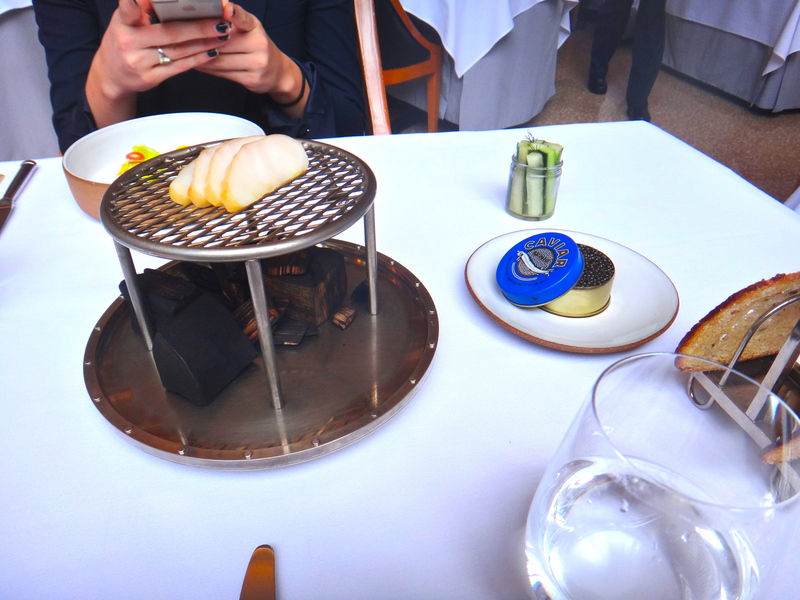 You also get to choose how your foie gras is prepared, for the sake of diversity I chose seared and my sister chose torchon. 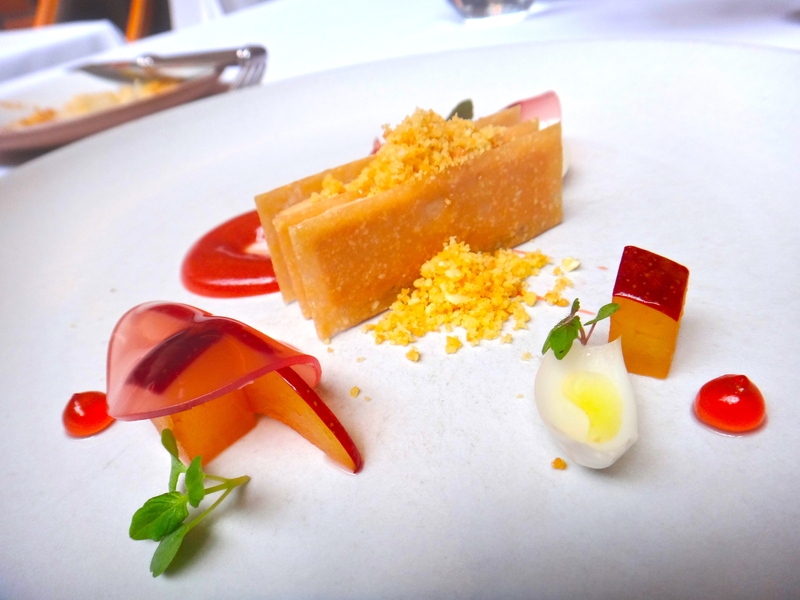 Loved the torchon with the crisps and the fruits on the plate, I have a hard time eating foie gras torchon without some bread or acidic fruit to contrast how rich it is. Did not think I would love the seared preparation as much but the sauce with it was incredible. 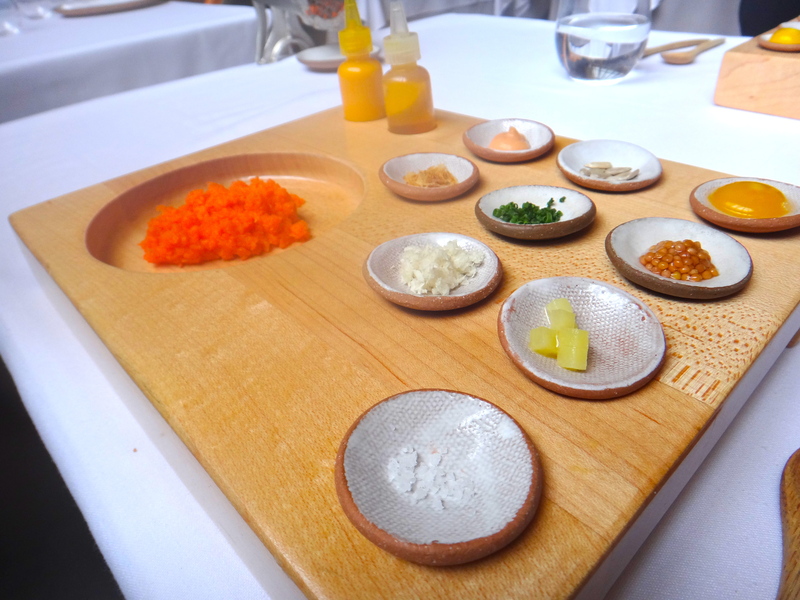 As soon as the guy brought the grinder to the table we said we could not wait for the carrot tartare. He was kind of disappointed and said it was supposed to be a surprise. 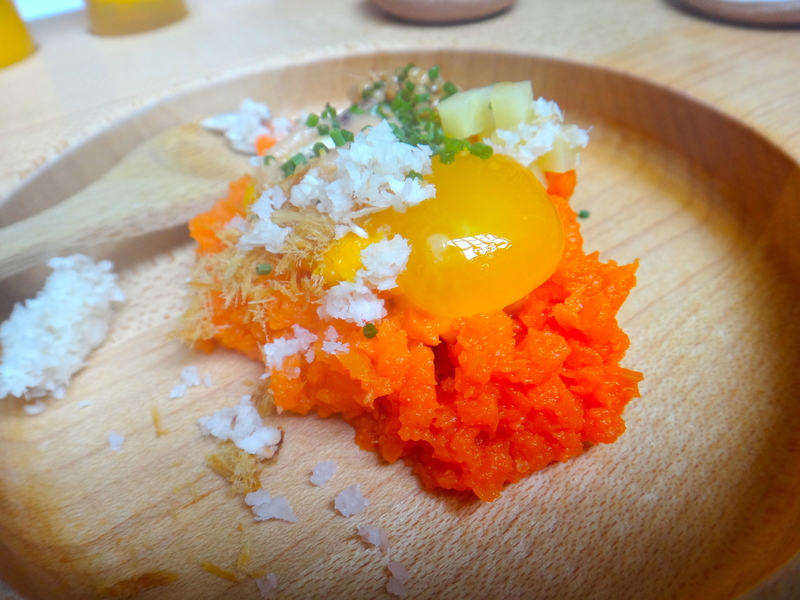 I think I’ve known about the carrot tartare for a long time but that might be due to frequenting an enormous roster of food sites on a regular basis. Sorry guy. Anyways this came with so many toppings; a quail egg yolk, bonito flakes, mustard seed, smoked sturgeon, sunflower seeds, chives, etc. Mixed everything in just because it was there. You eat it with bread and it was definitely an interesting flavour. 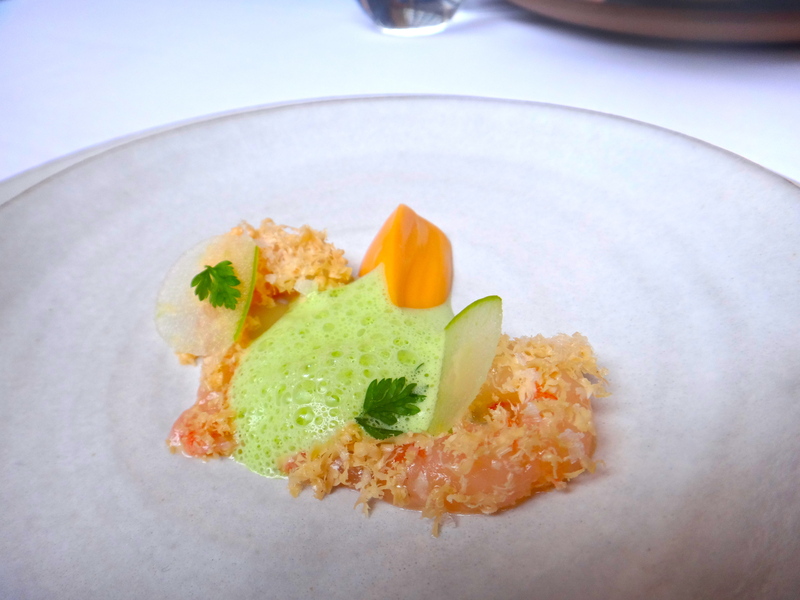 I liked it but ultimately thought it was more interesting than surprisingly tasty, unlike the sturgeon sabayon. Same for both us. 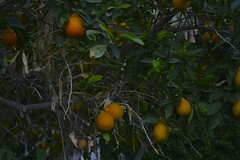 As it was fall this was supposed to evoke Thanksgiving. 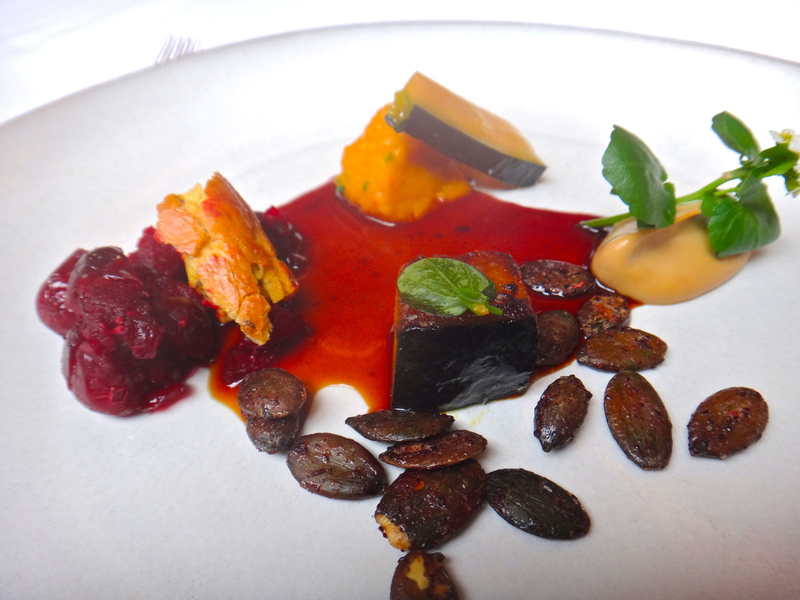 The butternut squash was prepared different ways and also came with cranberry compote and pumpkin seeds. This was lovely and a nice nod to the season. 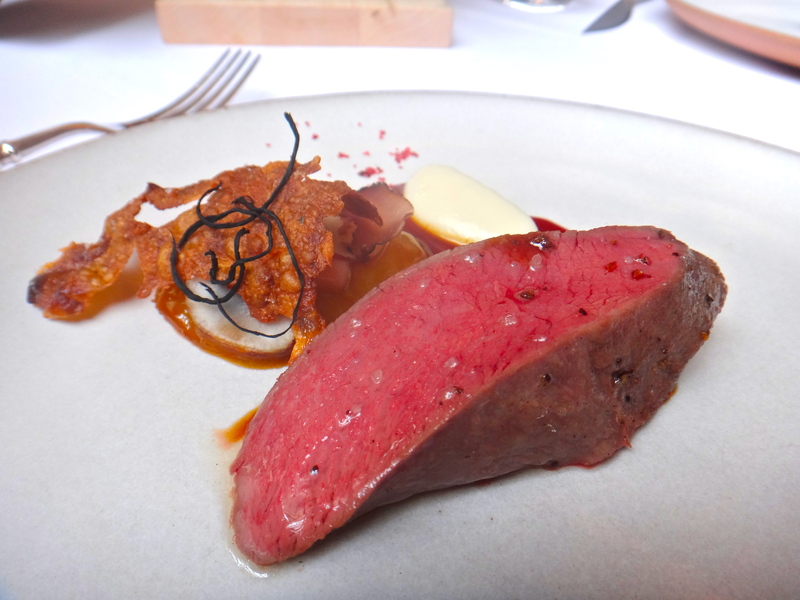 The venison loin they cook is first brought out to you then taken back to the kitchen. What comes to your table is a perfectly cooked venison loin and a skewer with different parts of venison, including a venison sausage, and a shallot. 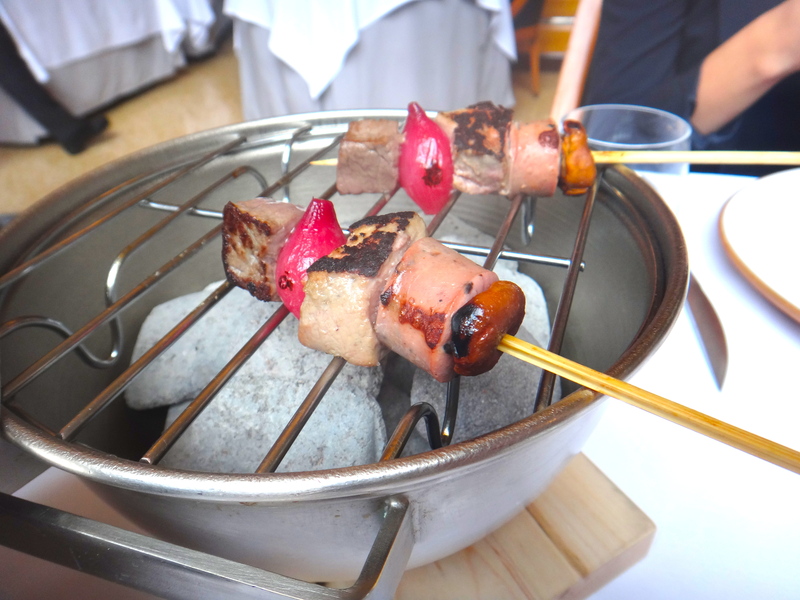 This was all lovely except for the grayish item on the skewer. Not sure what it was but it was definitely some kind of organ I have no love for. Very creamy, grainy texture and offal-y taste. Blergh. This is obviously a personal preference and if you are an offal-positive person I’m sure it was perfectly executed and whatnot. The venison loin was impossibly perfectly cooked although I wish there were more fatty elements on the plate to offset how lean venison is. 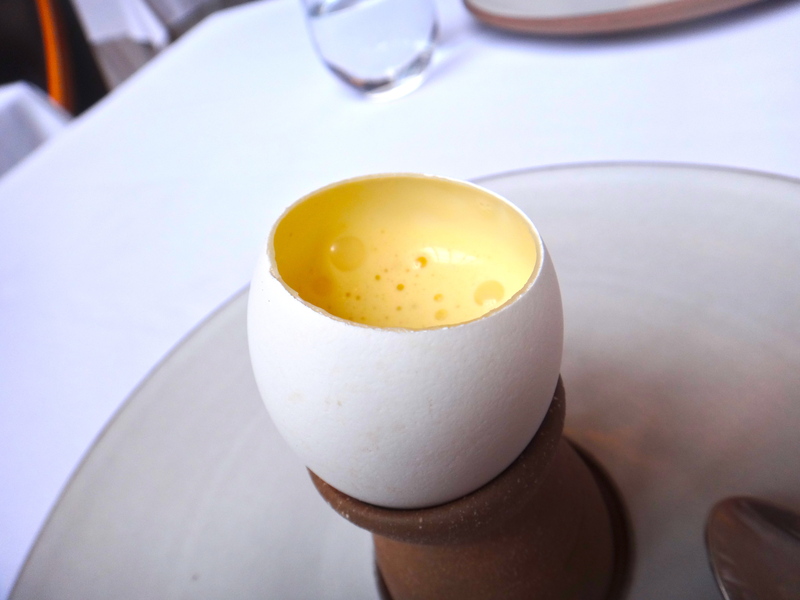 In the past when this was a beef course you also got beef consomme and a course with braised oxtail with potato foam and foie gras. Wish there had been something comparable for the venison course! 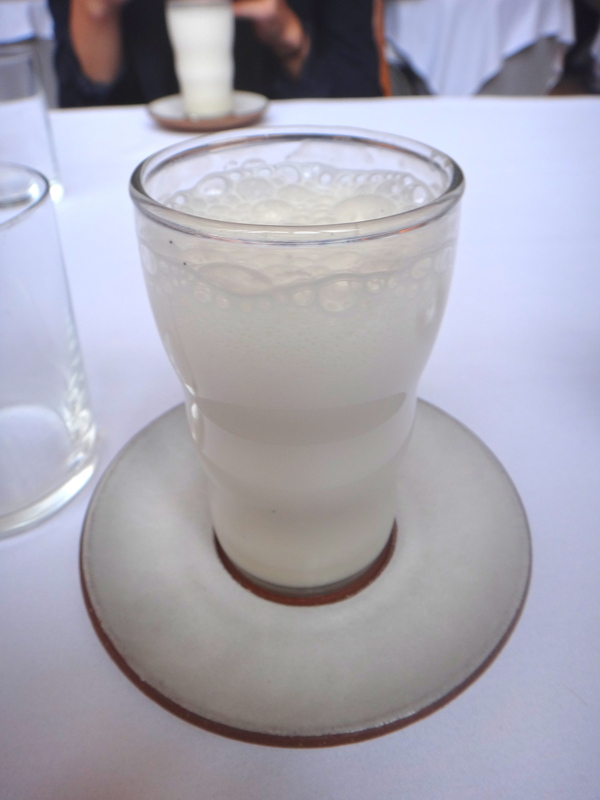 Egg cream with vanilla and seltzer. Have always been wary of trying these as the concept of a carbonated egg mixture is somewhat ambiguous in my mind. This was excellent though, very very vanilla-y. 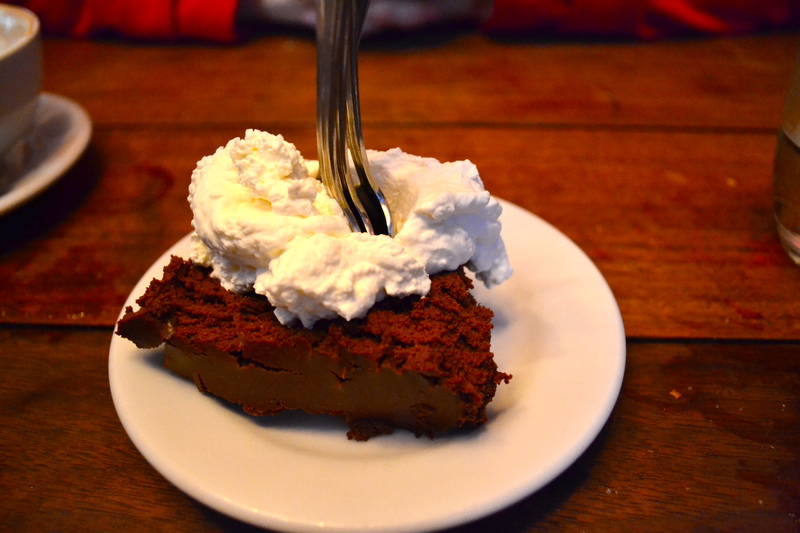 It also tasted very reminiscent of something we’d had in our childhood but could not figure out what it was. So so so good. 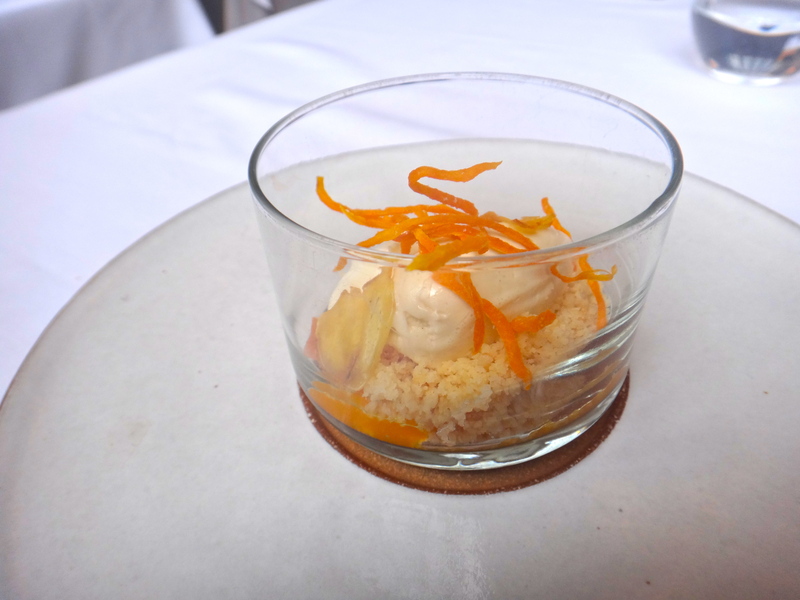 Sometimes desserts with too many elements can be a little too many things but everything here played well together and was expertly prepared on its own right. I am not a big creme brulee person as I do not like clunky rock-hard layers of caramelized sugar on my custards but this one had the thinnest crackle of caramelized sugar and I finally understood why one paired so well with the other. 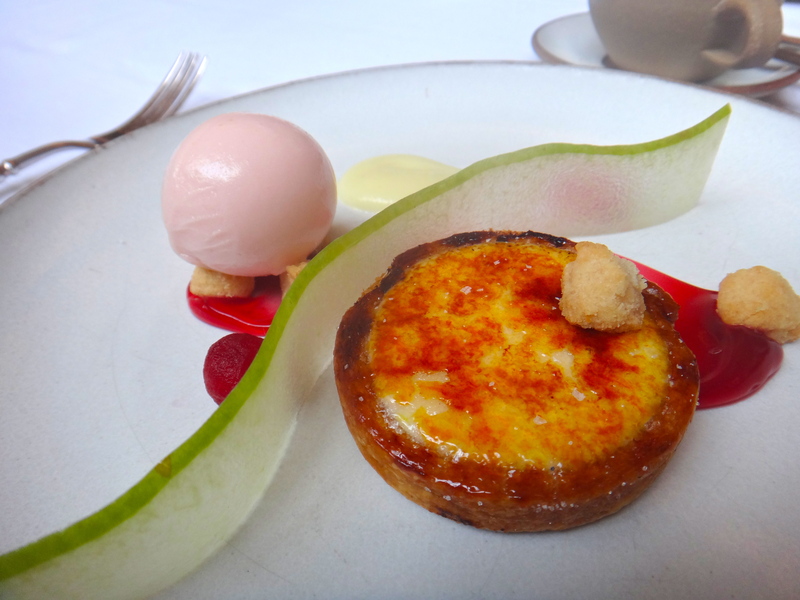 The tart was very rich and it was nicely offset by all the other lighter elements on the plate. 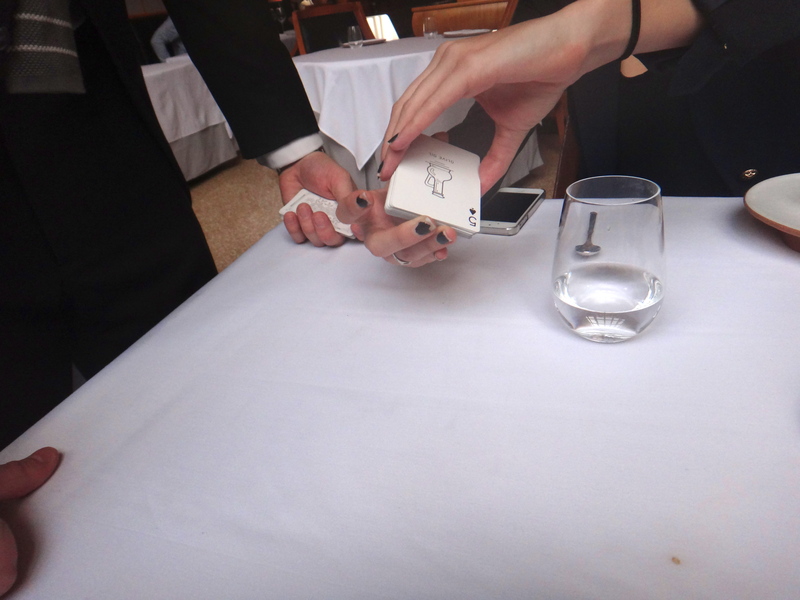 Although you can’t tell from the first picture, this is the card magic trick they do. You get your dessert course and after picking two random cards from the shuffled cards, ta-da! 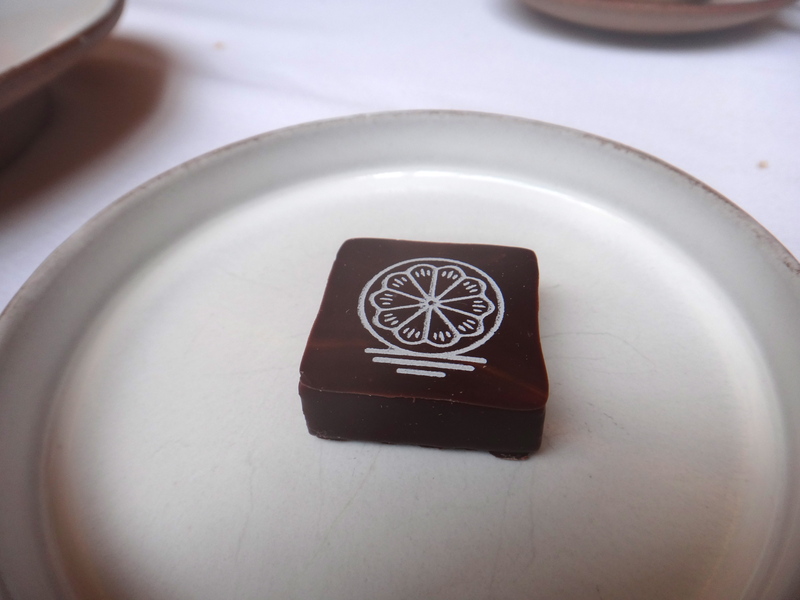 You lift off your plate and underneath is a chocolate flavored like the card you picked. We got orange and lemon and I was a little sad considering all the other more exciting flavors (passion fruit i love you), but they were surprisingly really really good. The squash cheesecake was interesting but ultimately I do not love squash with sweet elements so this was not my favorite. I blame that on particularly gross cloyingly sweet and overly creamy cafeteria butternut squash soup I had in college once but unfortunately the distaste stuck with me. 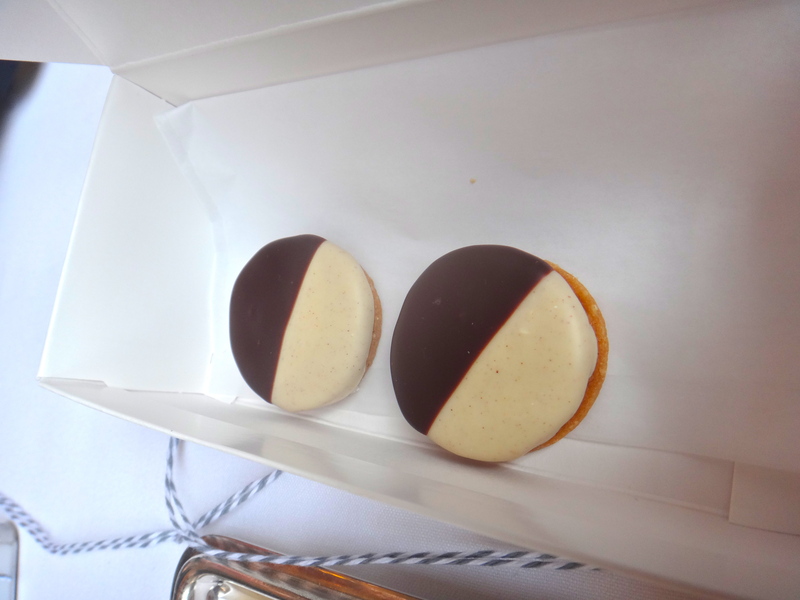 And here we are full circle with sweet black & white cookies. Very Lion King. 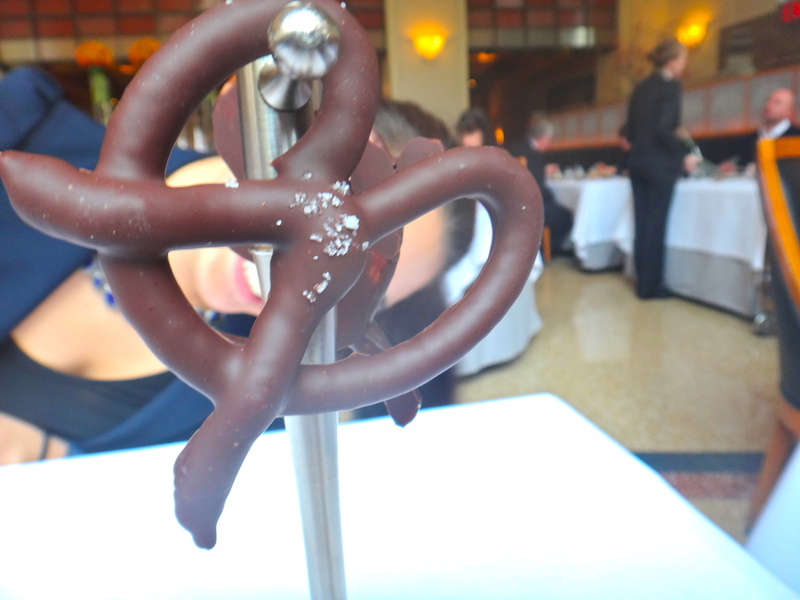 The pretzel is actually made up of ground pretzels that are mixed with white chocolate and then reconstituted into pretzel form and dipped into chocolate and sea salt…Very Inception. 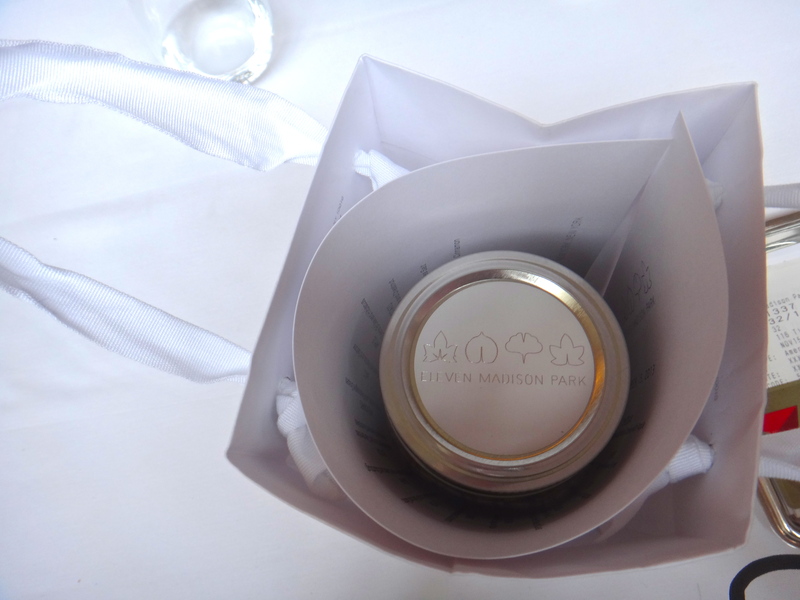 Once you are done they give you an adorable little bag with a personalized mason jar filled with EMP granola. 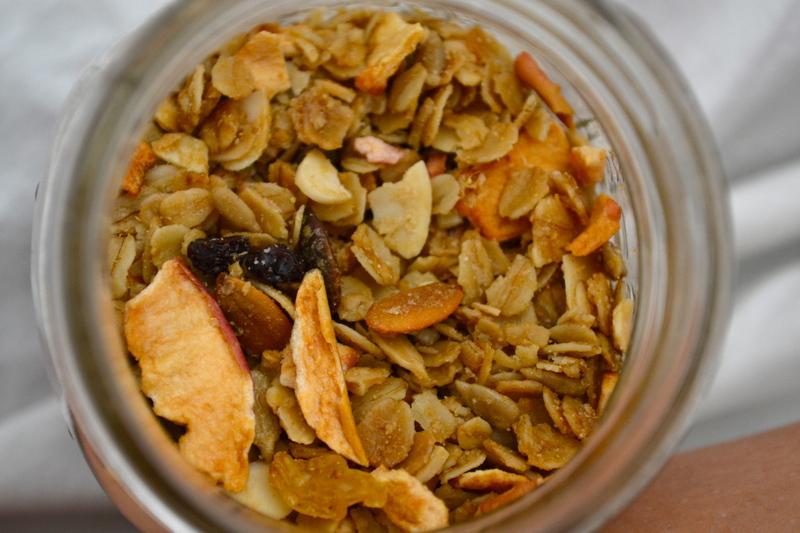 This was pretty great stuff with lots of dried peaches, pumpkin seeds and all kinds of other stuff. 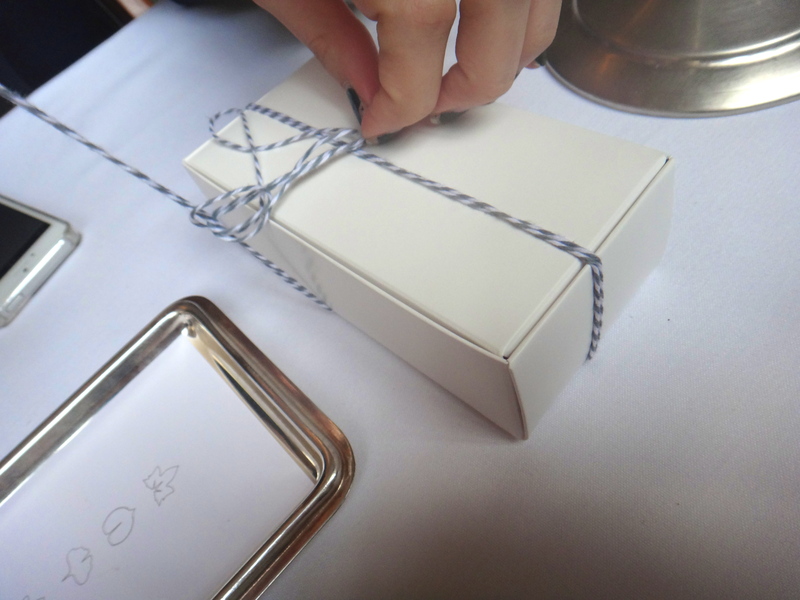 Loved this nice touch at the end of the meal. Overall this was a pricey experience we thought was completely worth it. It’s a 3-4 hour ordeal. Possibly less if you eat as fast as us but that’s pretty questionable. Pretty sure we ruined the surprises for everyone considering we were always 2 courses ahead of everyone. Our bad. 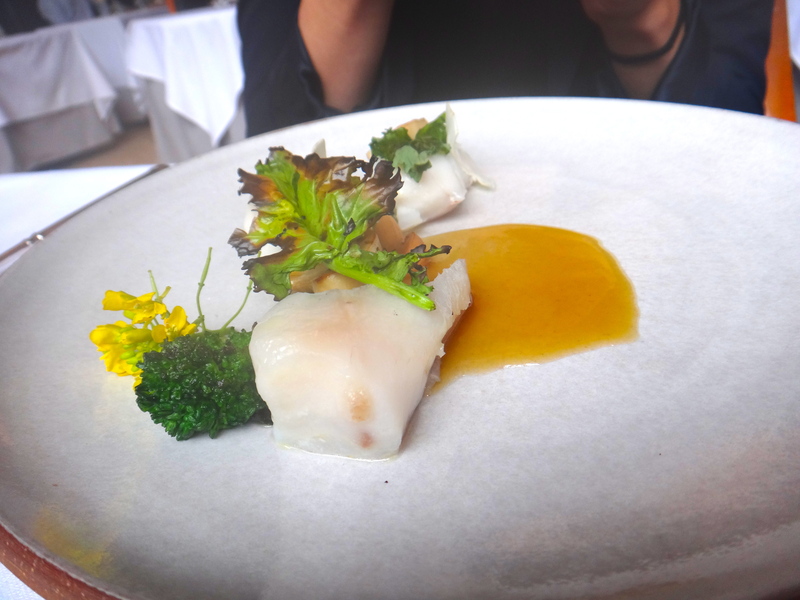 The service was phenomenal, a perfect mix of the professional formality required at that level of restaurant but still very friendly and fun. 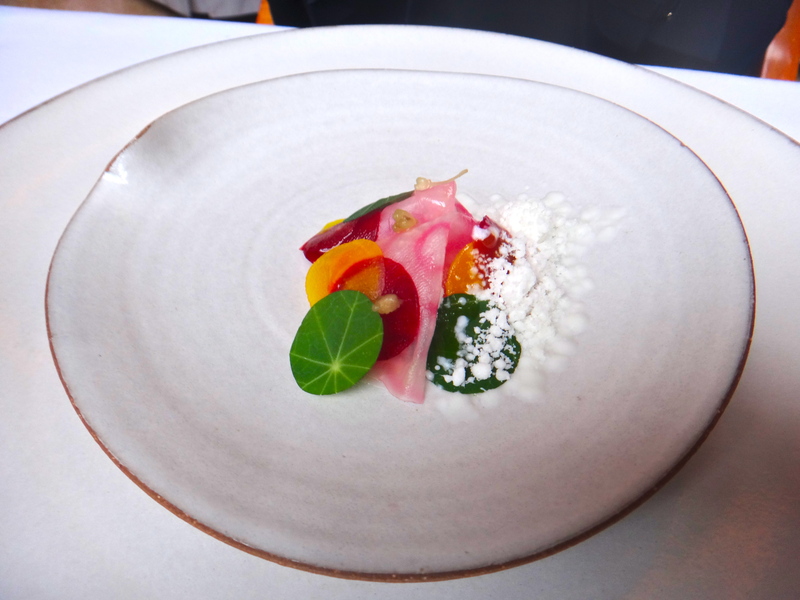 You get different people presenting the dishes and they are the ones who made the dish which we thought was really cool. 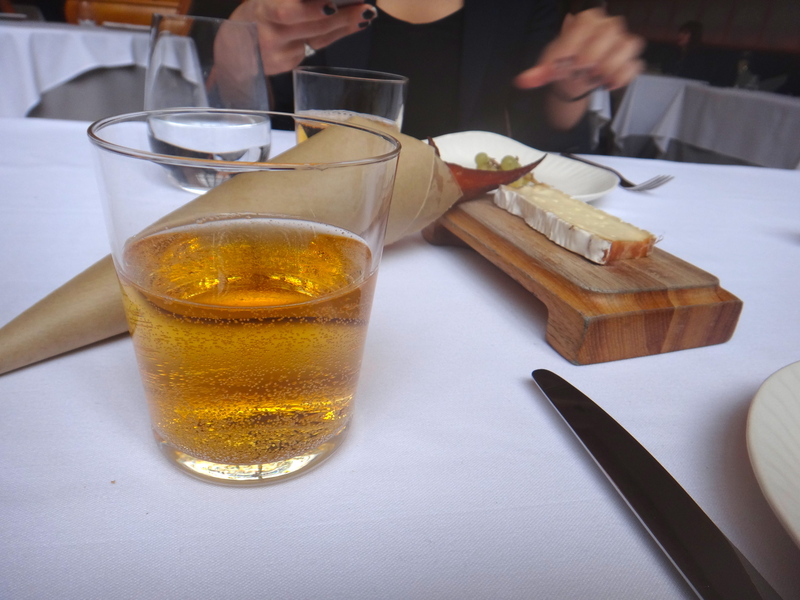 And although there were people ordering wine pairings or bottles of Champagne our servers were perfectly fine with us just sippin’ on tap water. So far we’ve only reviewed SD restaurants but after a vacation in Greece I thought it’d be great to share some pictures of the local food. And the beaches. The beaches are pretty nice too. 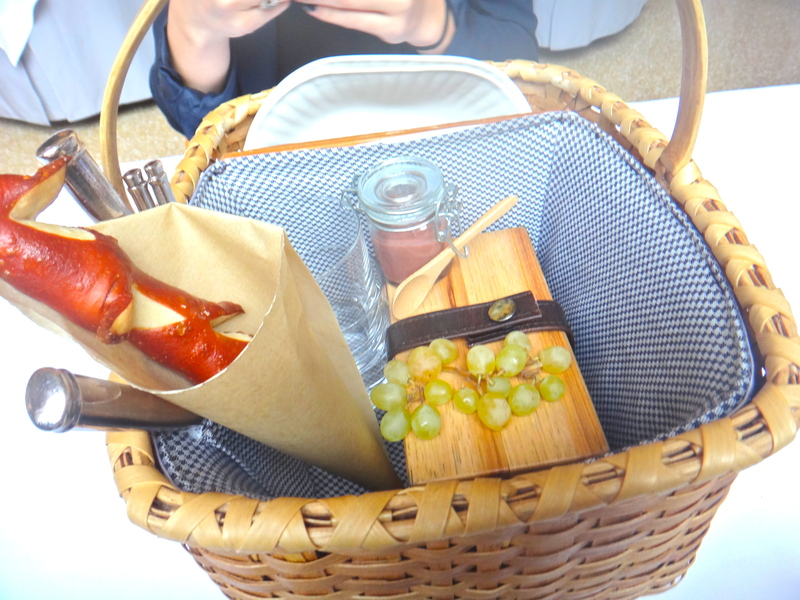 So some of the dishes we tried were at the beach above. 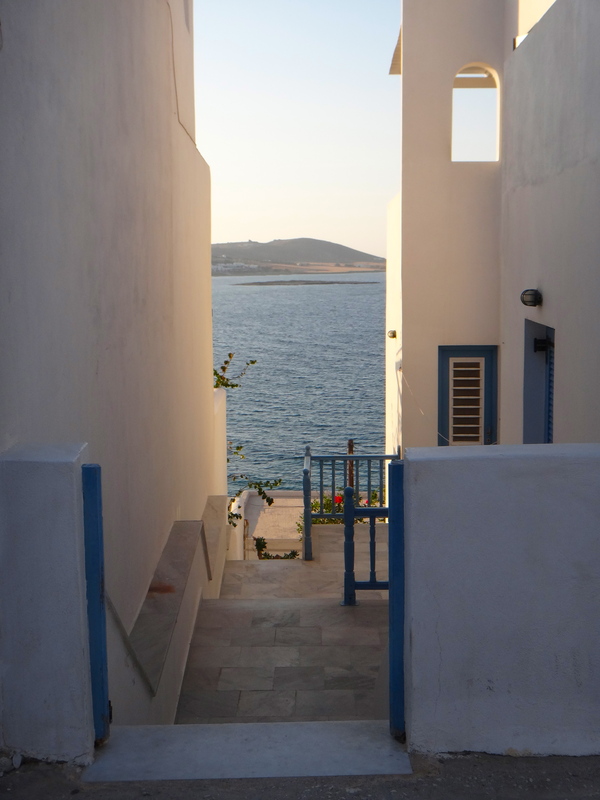 Koufonissia is a small island, part of the Little Cyclades. 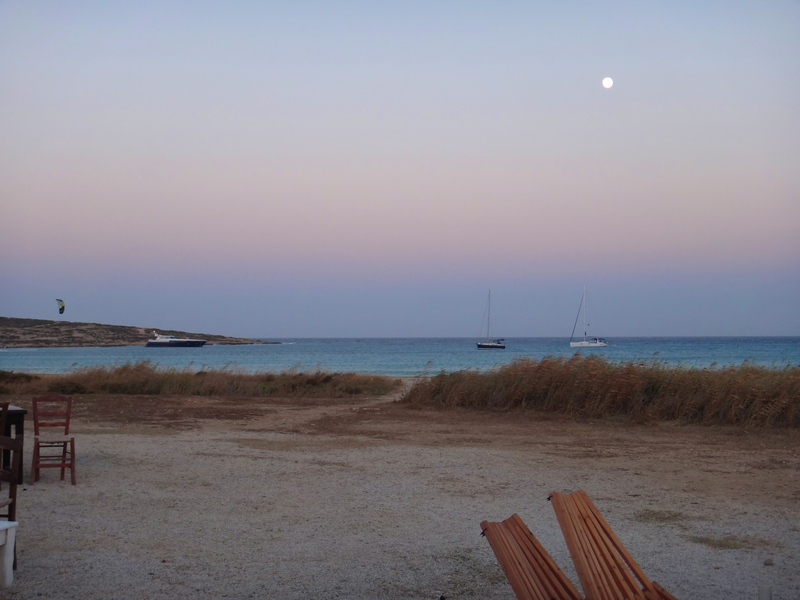 You can get to Pori Beach by boat or by taking a ferry to Koufonissia then taking a bus to Pori. There are exactly two restaurants on the beach and besides that you’d be hard pressed to find any other buildings around. The restaurant closer to the beach had way more people in it so that is where we went. 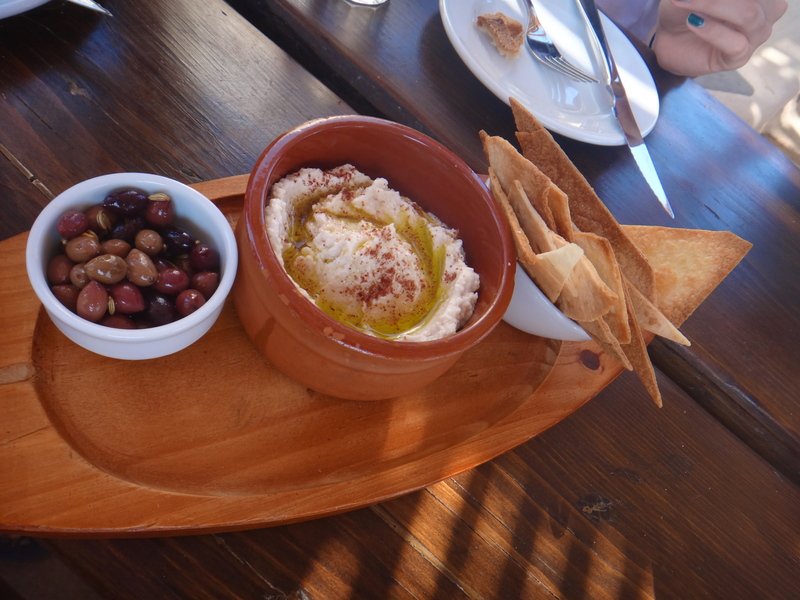 The first dish we tried was Taramasalata. 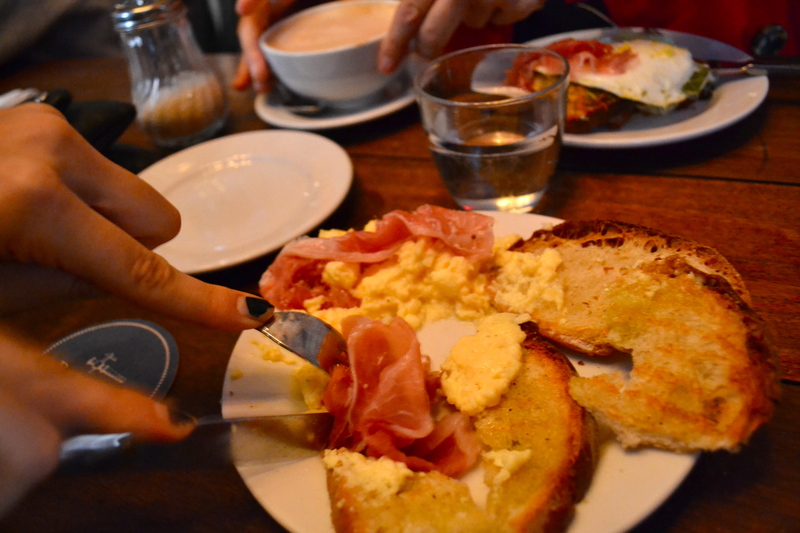 Our waitress simply described it as a dip that came with bread and that it was very good, so we were game. Only after it came and we were already halfway through eating it that we discovered there was fish roe in it. This was totally fine by us but I guess if you are vegetarian or have allergies I would tread carefully as in a lot of restaurants their English may not be super extensive. 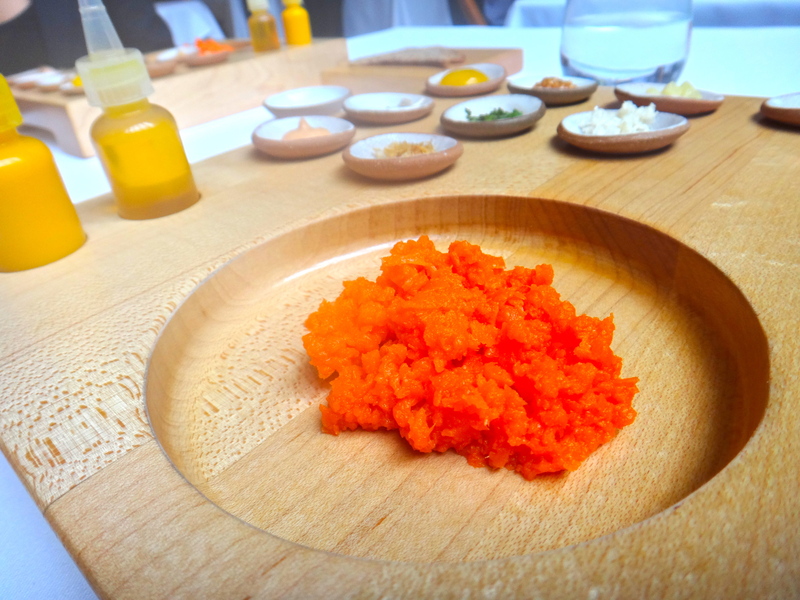 The basic ingredients in taramasalata are carp roe, olive oil, bread crumbs, vinegar, lemon and salt. It has a very nice salty, creamy flavor and is nor overtly fishy, I thought it had more of a umami flavor than an obvious fish flavor. Really good with the pita chips that came although I wish some soft bread would have come too. 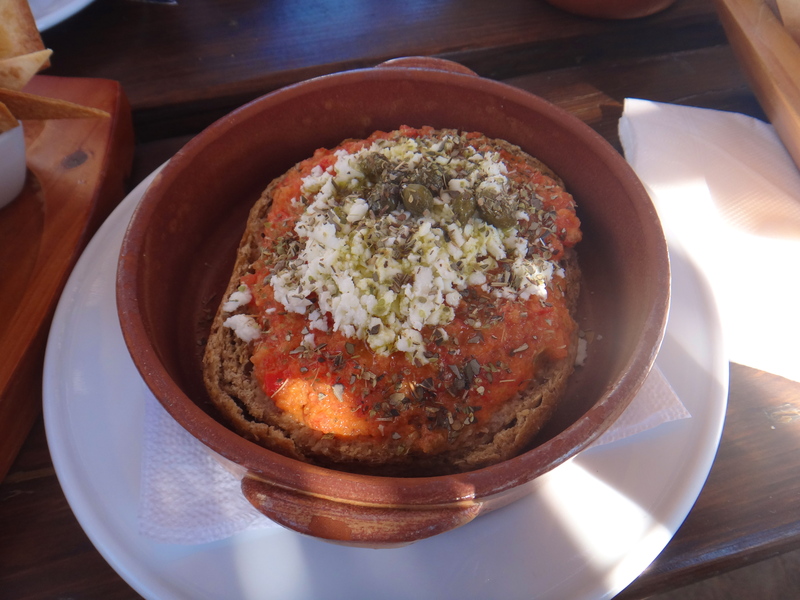 The next dish we tried was a favorite of the trip, Cretan Husk. 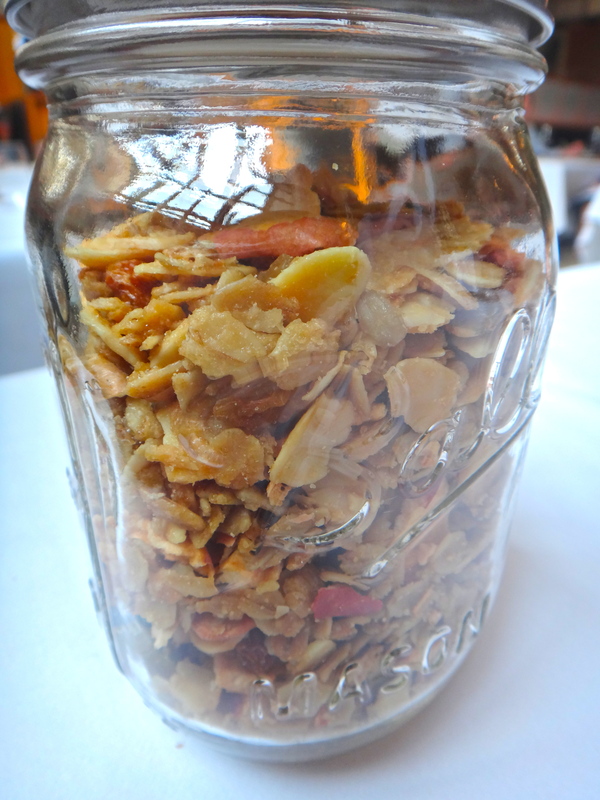 Cretan husk is very simple but its the one dish I can’t wait to make at home. They use husk bread which is a stale ish whole wheat country bread and then top it with a very simply, barely cooked tomato sauce, capers and a fresh cheese. 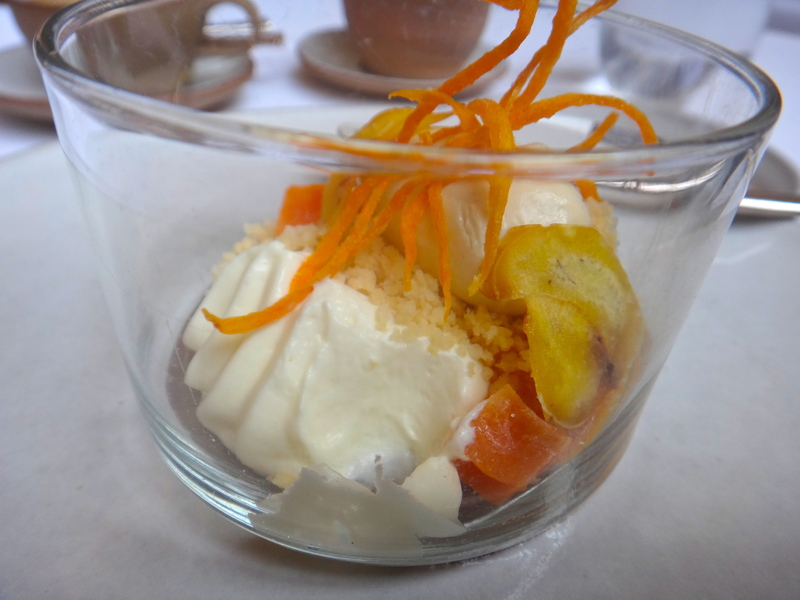 We saw feta used as the cheese often but in some islands they also used a mild local goat cheese. I think I’m gonna try chevre or really good feta in olive oil when I attempt to make it at home. It’s deceptively simple but soooo tasty. 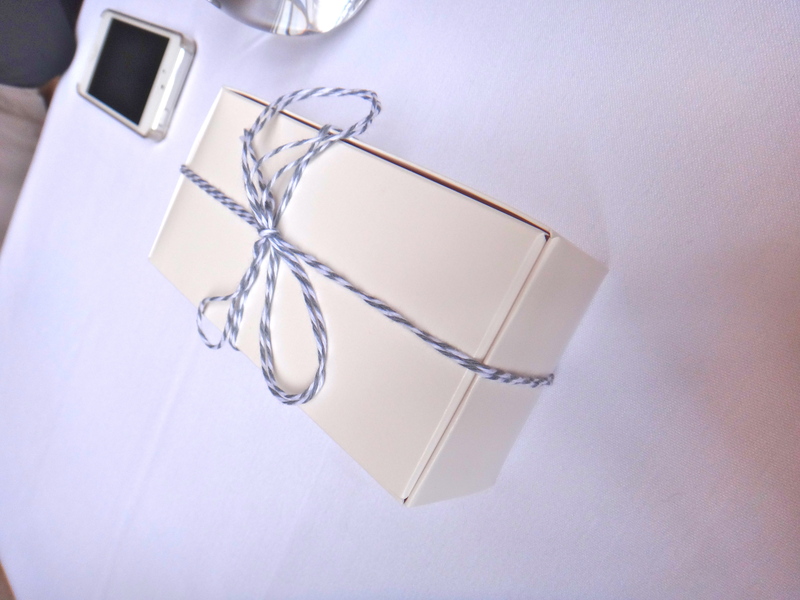 We must have ordered it at almost every restaurant we went to after we discovered it. 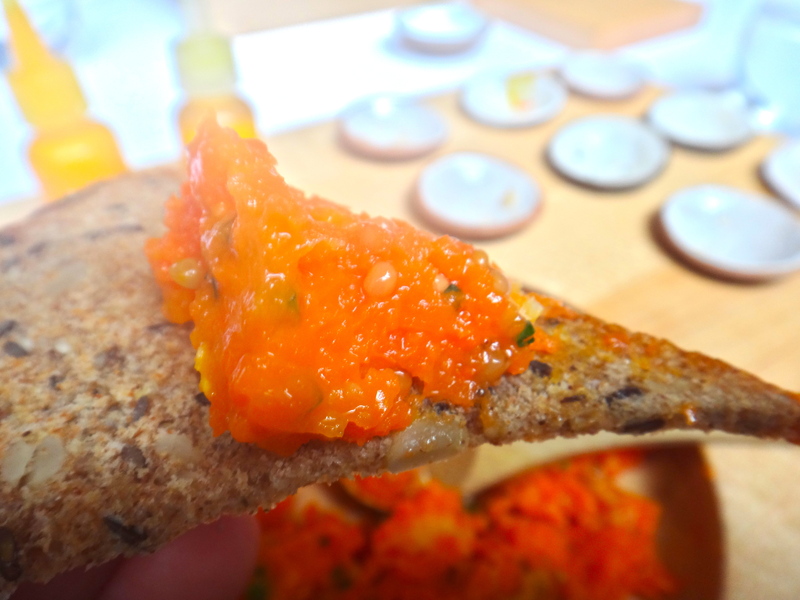 The bread sops up the fresh tomato sauce and you have the creamy cheese and a hint of sharpness from the capers. If you like panzanella this is right up your alley. 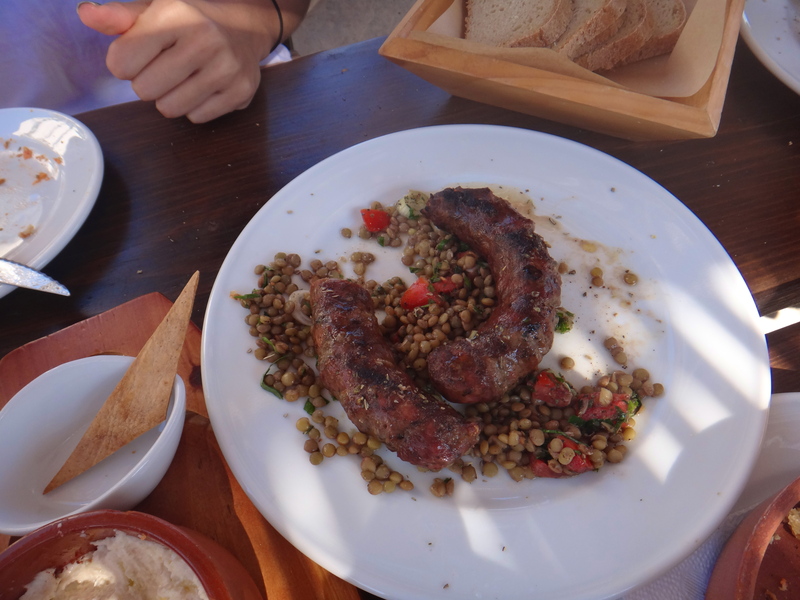 After our appetizers I ordered the Naxos Sausage with Lentils. The sausage I think was goat and it had nice char marks and a slightly gamey flavor. A lot of food for one plate. 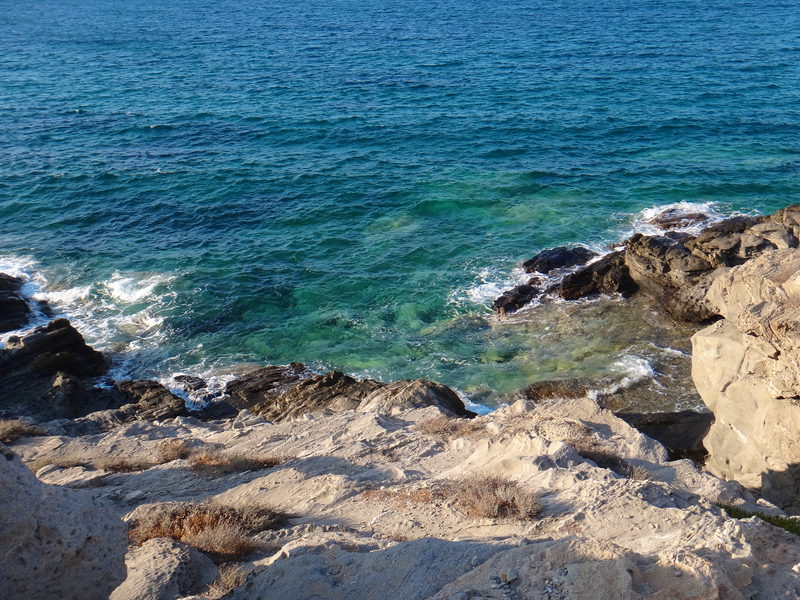 One positive side of Greece is that its quite inexpensive compared to the Western European countries. 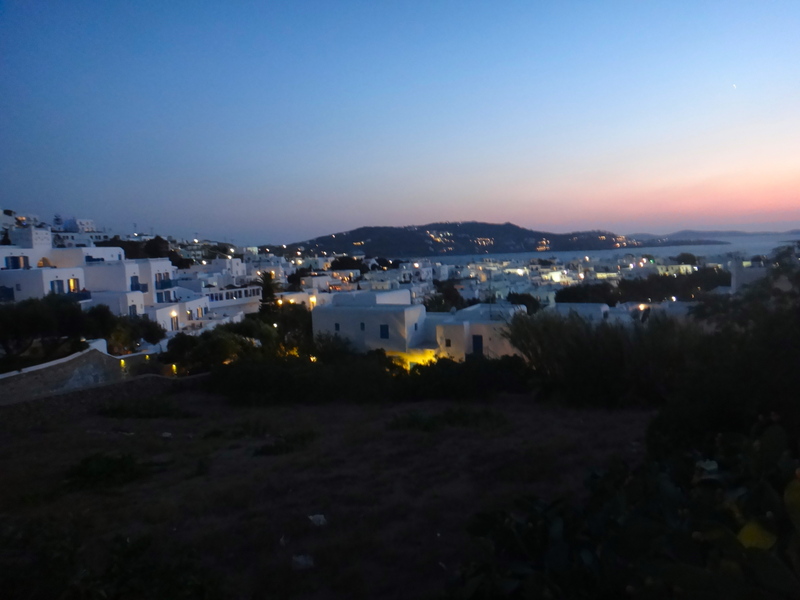 Things are a little pricier in Mykonos or Santorini but even then you can easily find yummy, large meals for very affordable prices. Like this one. The other entree we got was the Baby Goat with Eggplant Puree. 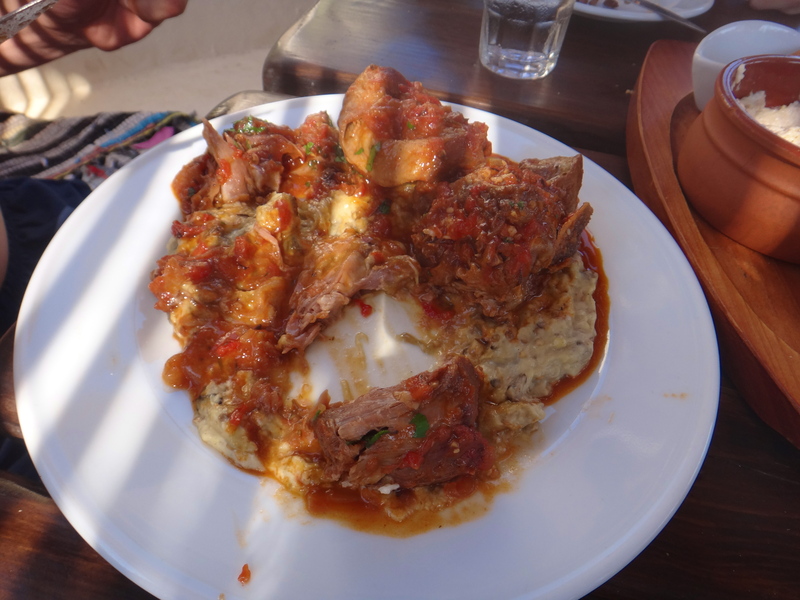 The meat was super tender and a little gamey with a mild tomato sauce and a puree of smoky grilled eggplant. The braised meat with the slightly sweet tomato sauce and the silky, smoky puree was amazing. Everything we had was tasty and the ingredients and preparation were of great quality. For dessert I had a banana, milk, honey, cinnamon and sesame smoothie I didn’t take any pictures of. We were pretty happy with this meal. They also turn into a bar with live music later at night, that night they had Brazilian bossa nova. It went really well with the great food and the great view. Highly recommended. So the next meal we have pictures of was slightly less successful. 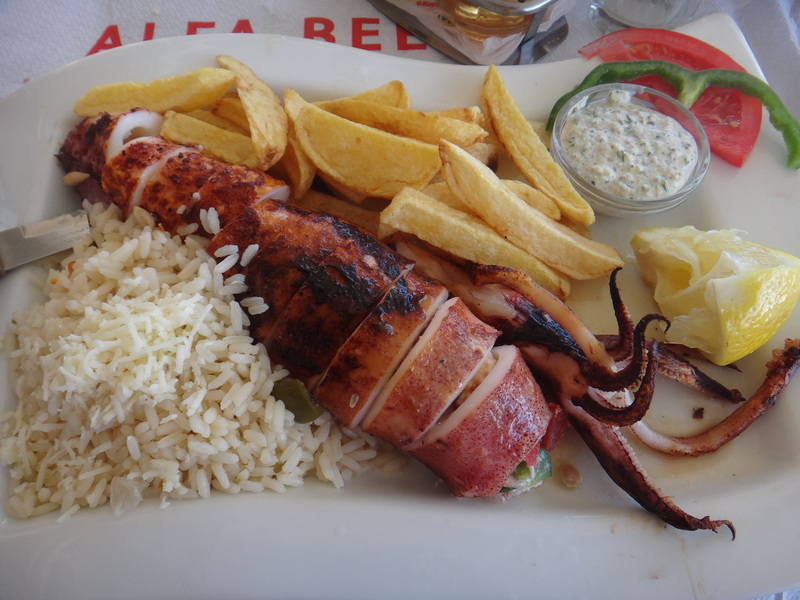 This meal was in Paros island right by the private marina. Also can’t remember the name of this restaurant but it was at the end of the first row of restaurants. For appetizers we got a Cretan Salad. 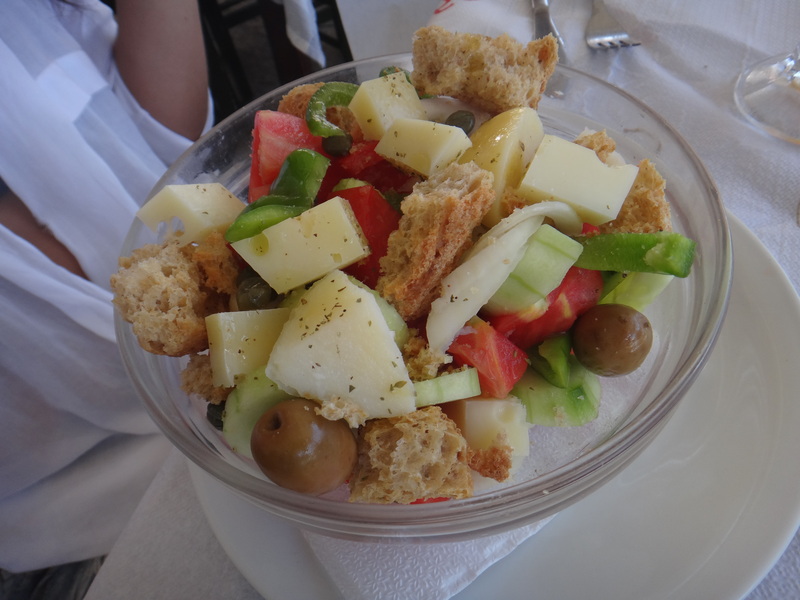 This was described as tomatoes, olives, onions, cucumbers, potatoes, and Cretan bread. Weirdly instead of potatoes we got cubes of Swiss cheese in the salad. 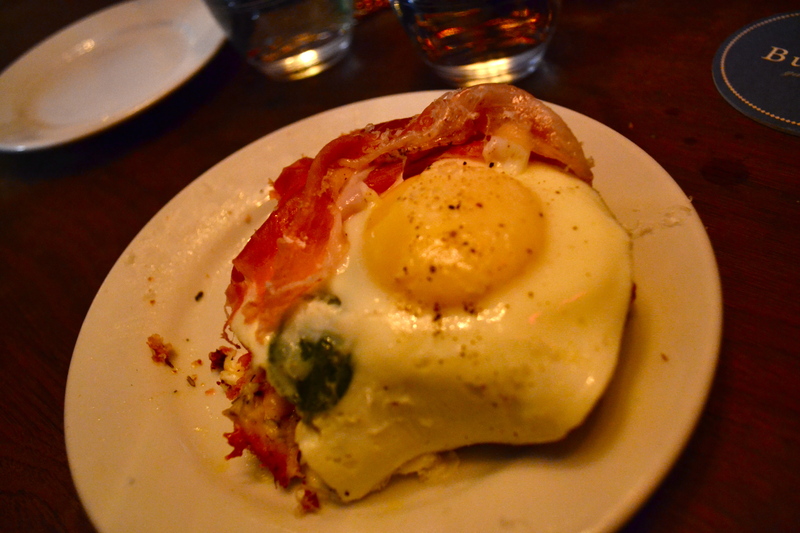 This came with no dressing so we mixed red wine vinegar and olive oil and poured it over top. Almost every restaurant will have olive oil and red wine vinegar at the table which is nice because they normally give you bread but no butter or anything to put on the bread. For an entree I got the Stuffed Calamari. It said it was stuffed with feta, peppers and sundried tomatoes and came with rice and fries. I asked for roasted potatoes instead and although the waiter agreed to it I got fries anyways. The other entree we got was Cretan Casserole. This was also cooked goat but what we got was not very casserole-y. It came with fries and rice but the waiter forgot the rice. Although it doesn’t look super appetizing the meat was actually pretty good. Sadly there wasn’t a lot of it and there was a lot of bone, fat, and assorted tissues. 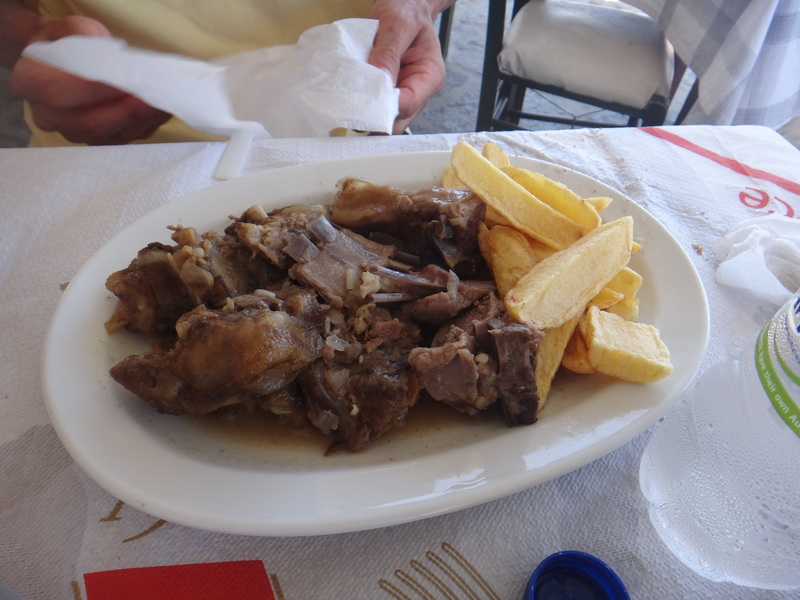 Nothing like the baby goat we had in Koufonissia! Overall we ate a lot of good food in Greece. Our number one tip would be to not eat at the restaurants that are right on the water/boardwalk especially if they’re close to the port or where the ferry arrives. 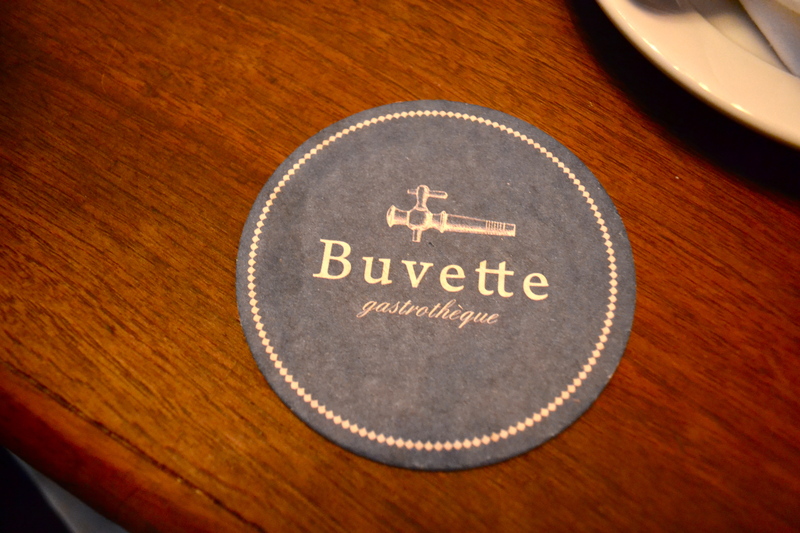 These restaurants are mostly there for the cheap drinks and the food is definitely secondary. 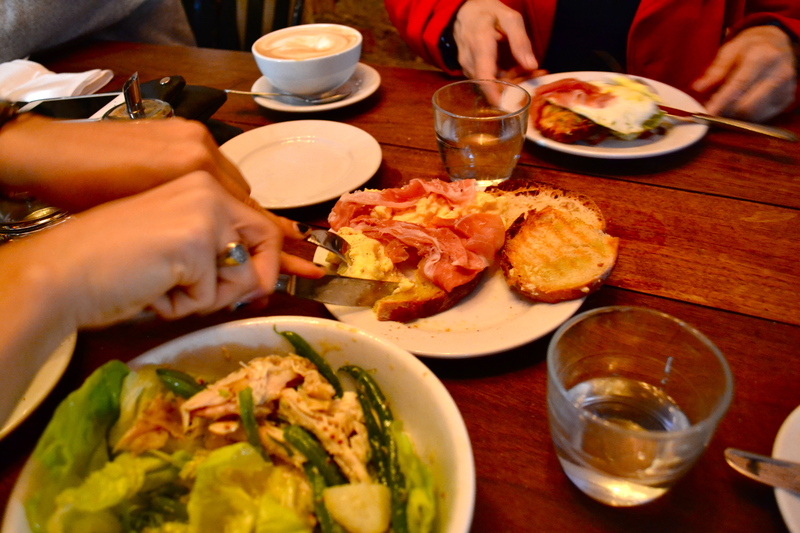 If you meander in a little into the towns you’ll find cheaper and much better food. Naturally it always pays to ask a local as well or to do some internet sleuthing beforehand. 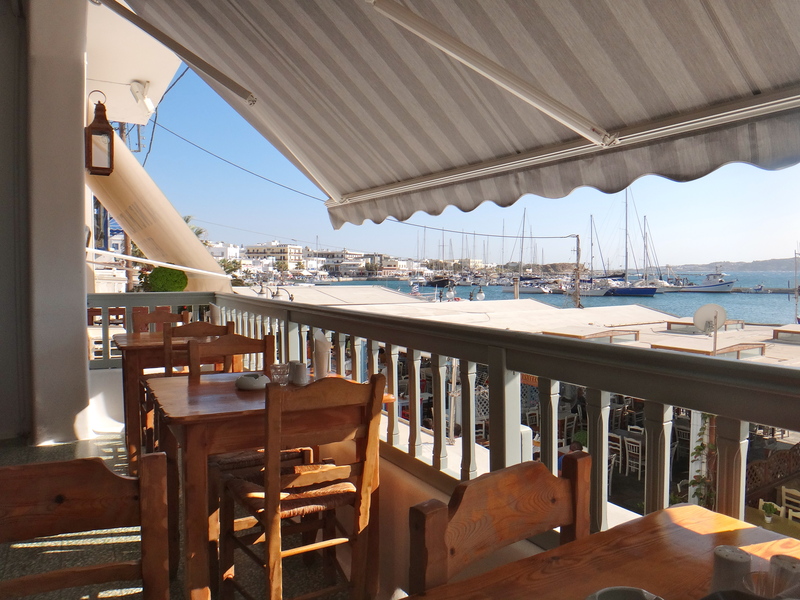 Our favorite restaurant was in Naxos island. It was only a row behind the boardwalk restaurants advertising 4 euro drinks but it was nice and friendly with only one older lady manning the entire place. She didn’t speak a lick on English and as soon as we sat she handed us the Greek-English menus and after we sat an older Greek lady with a scarf neatly tied around her head came and sat in the table next to us. Always a good sign. Her food was simple but so good. Everything tasted fresh and she did all the cooking. 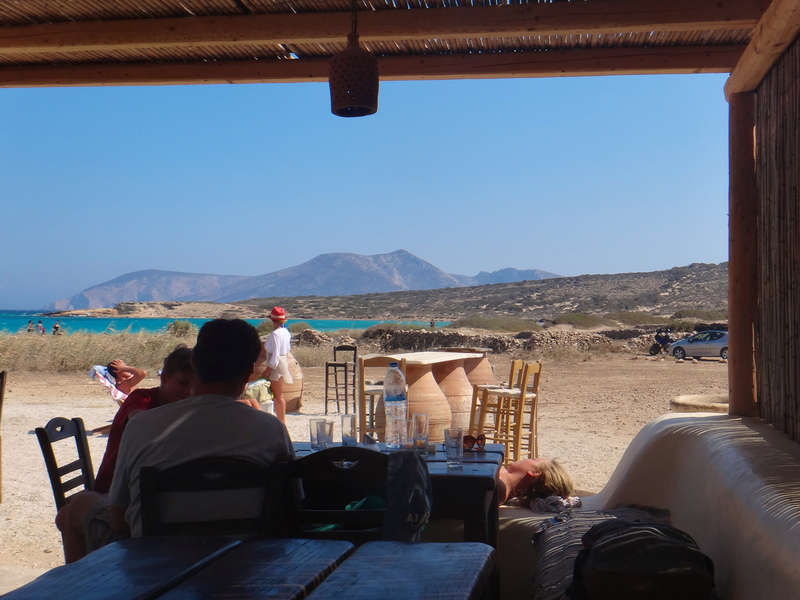 Sadly we can’t remember the name something like “Family Tavern”, if you get to Naxos by ferry go straight to the boardwalk with all the restaurants and go behind them and walk to the right until you see a white and light teal building. 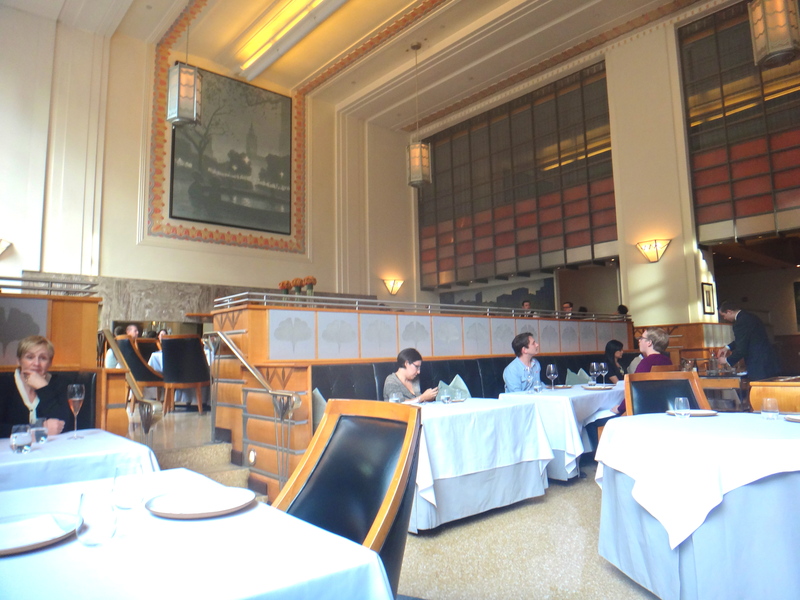 If you find yourself seated in the patio below you are golden. The roasted potatoes with oregano and lemon are out of this world and the lady always gave us free dessert whether it was a slice of homemade orange cake or perfectly ripe figs. If we go back we will definitely be stopping by here again. Ok. 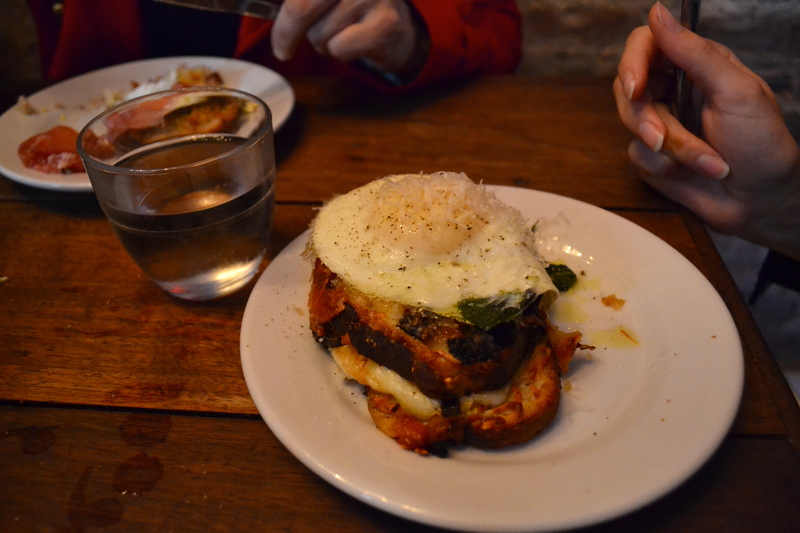 This is not somewhere where you come on a date night and order a Pinot Noir then linger over dinner while picking between pizza with zucchini blossoms and fresh figs or mashed potatoes or whatever is trendy to throw on pizzas these days. This is somewhere to stop by and grab fast, fresh and delicious no-nonsense pizza with friends before hitting the bars or picking up a whole pizza to go when you’re to lazy to cook and you just want to eat yummy pizza in front of the TV (it happens). 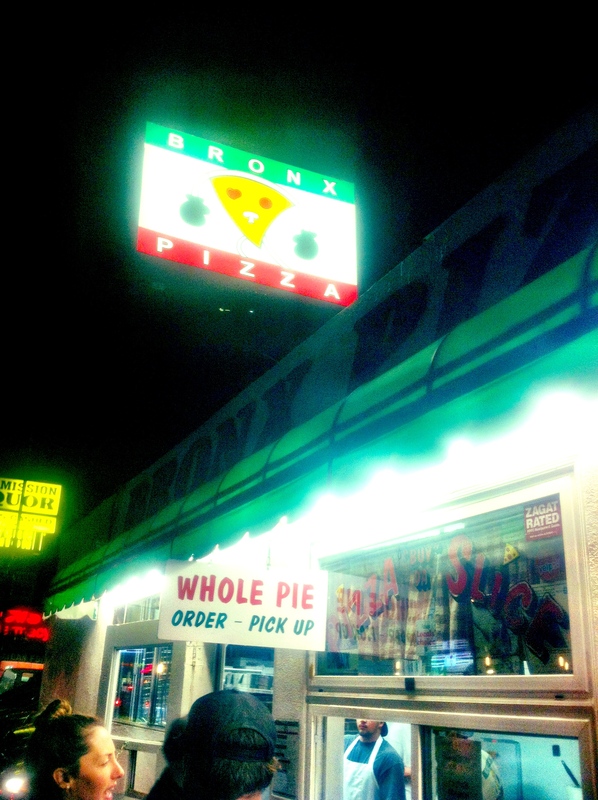 Bronx Pizza is located on Washington St. between 3rd and 4th in Hillcrest. The place looks rather small on the outside but there’s actually a lot of seating inside. When you walk up all the pizzas available by the slice are displayed. You walk in, tell them what you want, pay (cash only) and then go find a seat. It’s efficient, and if you see a long line fear not because they easily clear long lines and even though there were 5 people ahead of us we waited less than 5 minutes. 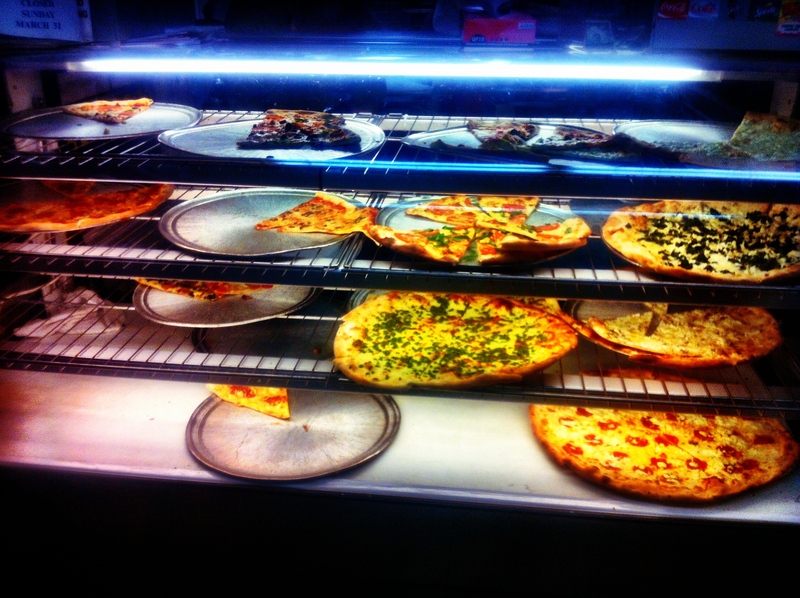 They have all the traditionals flavors – pepperoni, cheese, vegetarian, meat lover’s – and some more inventive options but nothing too crazy – pesto, white pizza (plain, with spinach or with mushrooms), tomato basil, pepperoni and peppers, artichoke pizza. ENTREE: We ordered the Tomato-Basil (actually a white pizza with no sauce and fresh tomatoes and basil on top), the Pepperoni and Peppers (jalapeno and cherry to be exact) and the White Pizza with Mushrooms (mozzarella, ricotta, mushrooms). We loved the pepperoni with peppers; it was spicy, salty and cheesy with the cherry peppers adding more dimension and taste to basic pepperoni with jalapenos. 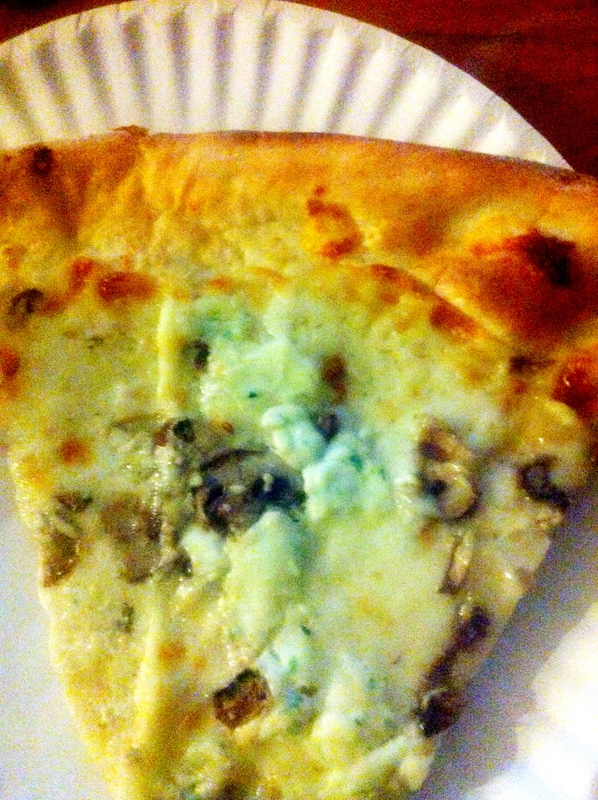 The white pizza with mushrooms was also excellent. 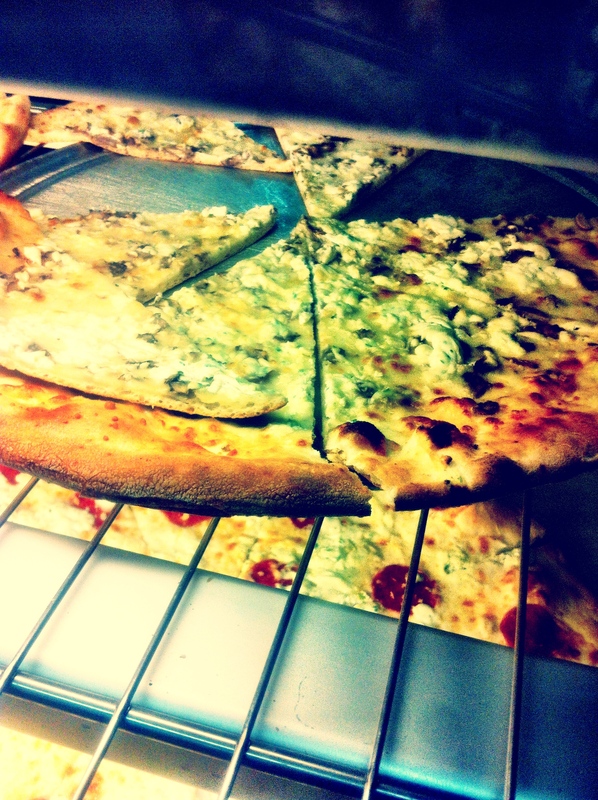 They mix the ricotta with herbs so it has more flavor and white pizza pairs well with mushrooms. The mushrooms were also well-cooked instead of those paper-y dry things you get with a lot of chain pizzas. 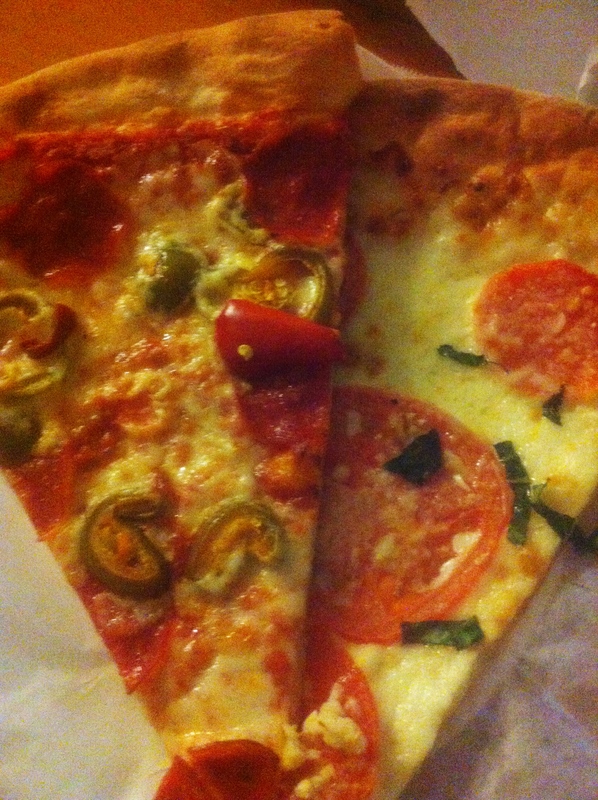 The tomato basil was nice but rather bland we will probably order the artichoke pizza next time instead. The crust wasn’t super thin but it was definitely New York style, we would have preferred a little more char and a little more chew but with the toppings it wasn’t bad at all. 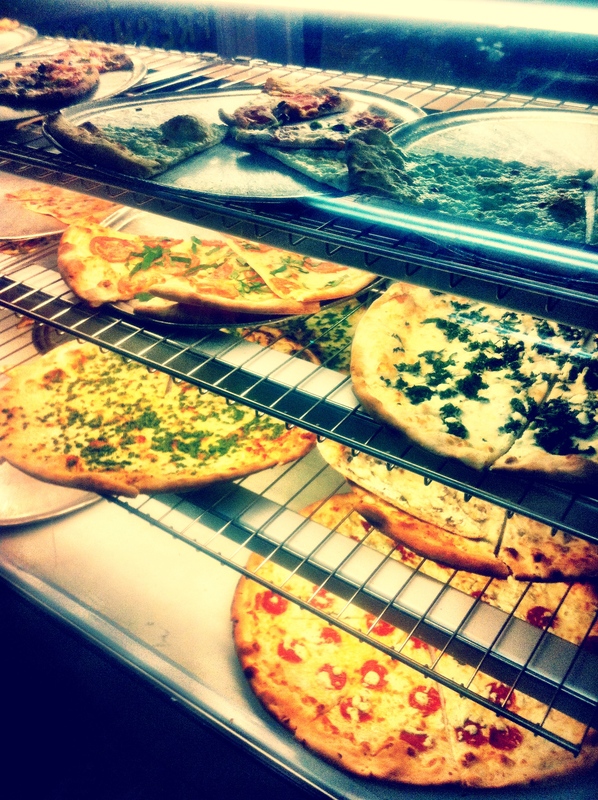 Overall we really liked Bronx Pizza, its a no frills establishment serving good food and its cheap and fast. We will be returning for the pesto pizza and the arthichoke pizza (and for how fast it is!). Jayne’s came highly recommended from a friend and after leaving Polite Provisions we were hungry then what do you know…Jayne’s Gastropub was right there. On the corner of Adams and 30th. How convenient. On the outside it looks like a simplified English pub. White building, dark green trim, and Jayne’s discreetly written on the front. Once you go inside its quite cozy with lots of dark wood. Its a smallish space with a smallish bar but the drinks sounded good and the place was packed, which is normally a good sign. We wanted to sit at the bar and just order appetizers then bounce, we told the hostess this and she was quite gracious and said we could wait for a spot at the bar or sit at a table outside. We chose to sit outside and this was quite lucky because their outside patio is gorgeous. 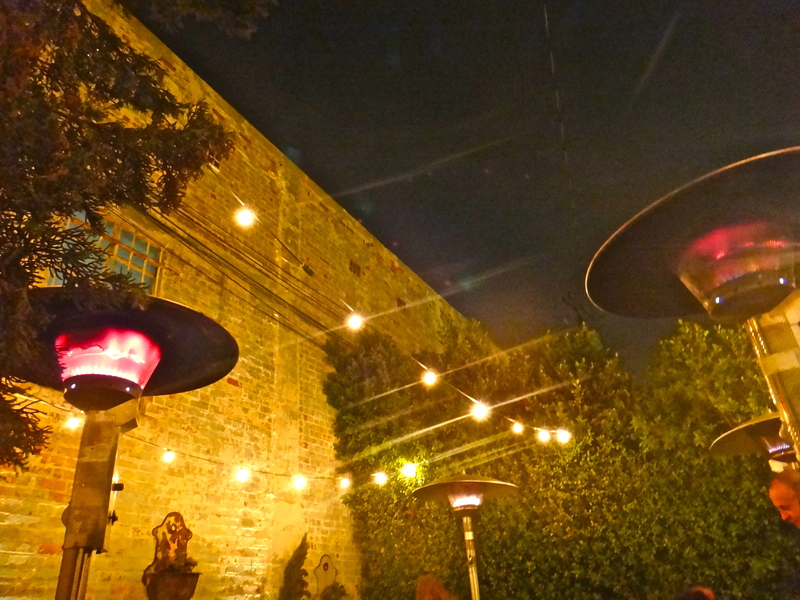 There are tall hedges surrounding the patio and then a tall wall with aged brick on one side. 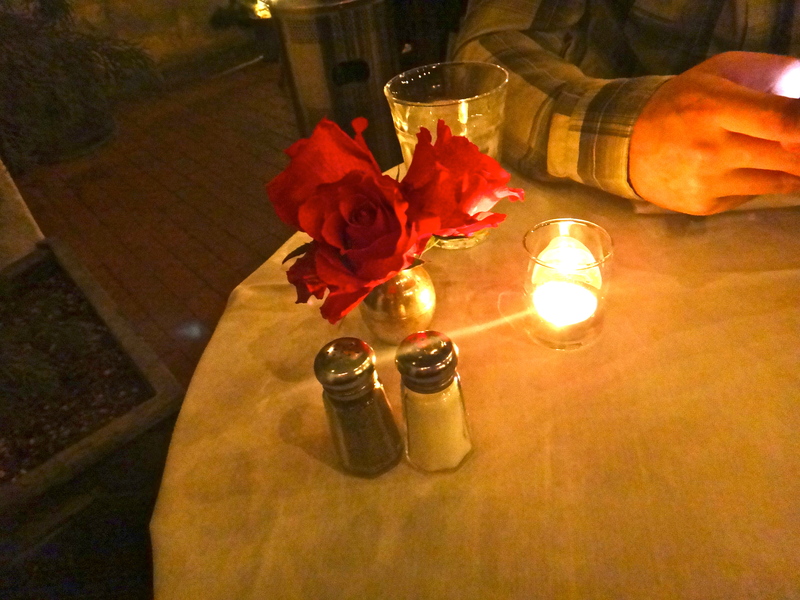 There are globe lights overhead and heaters to stay warm and the tables have white tableclothes and red roses. 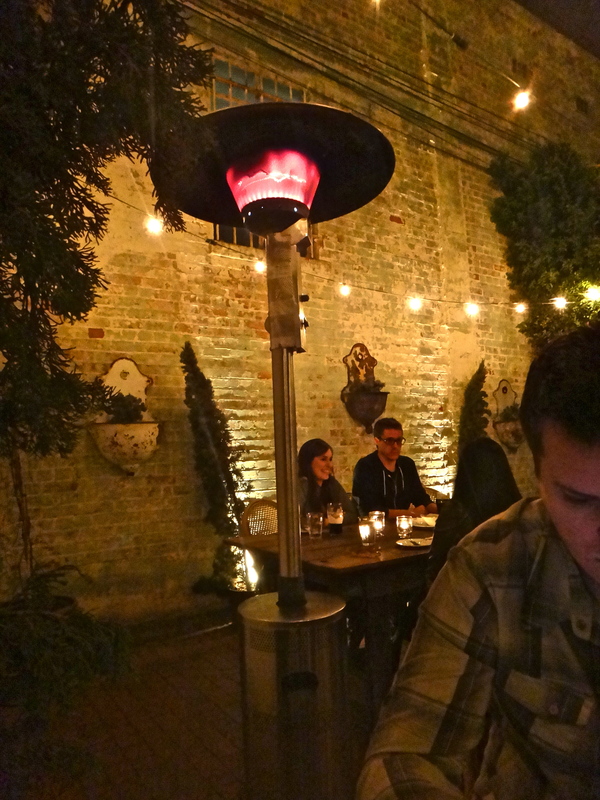 Its quite the charming place to have dinner and probably a perfect date spot. APPETIZERS: We ordered two appetizers, the Gambas al Aljillo and the Calamari. 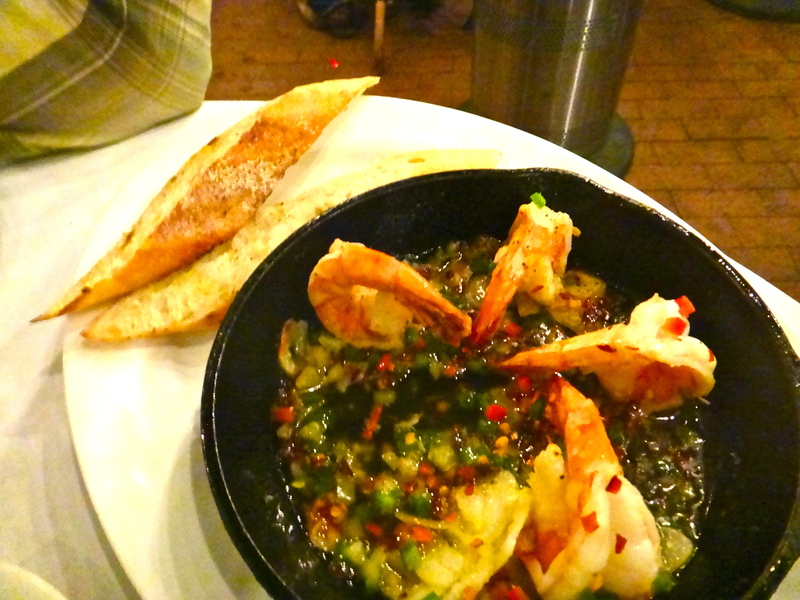 The Gambas were shrimp in a spicy garlic sauce with sliced baguette bread. Though the shrimp were good, the sauce was somewhat lacking. The chilis and garlic didn’t have enough time to infuse in the oil, so the oil was relatively flavorless. It was a little pricey for 6 shrimp as well. 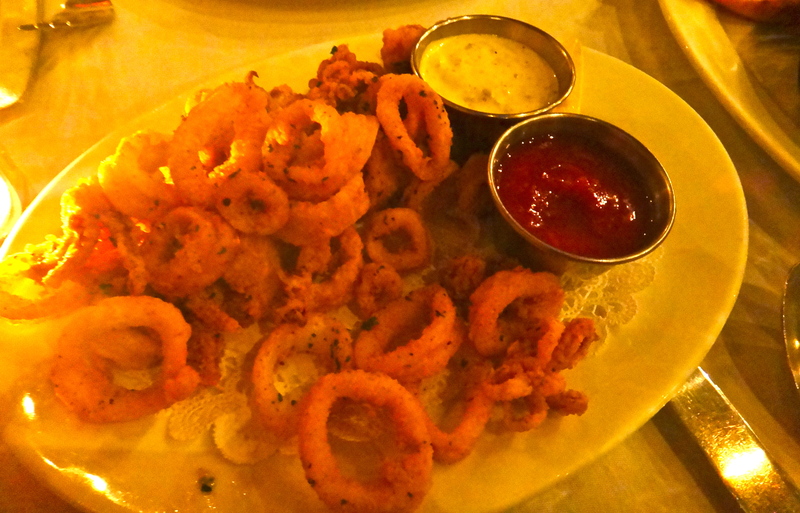 The calamari on the other hand was great. It was served piping hot and had the perfect amount of breading. 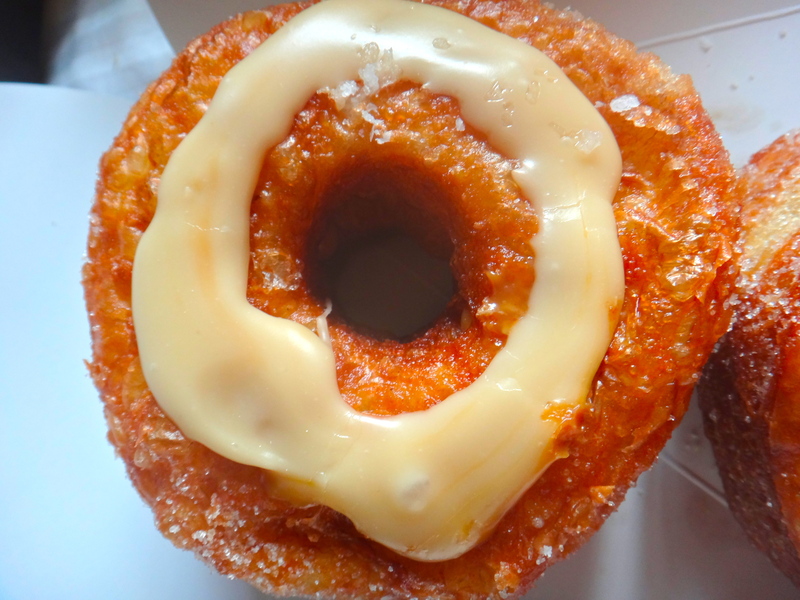 Sometimes you get too much cakey breading and its slipping off the calamari rings. 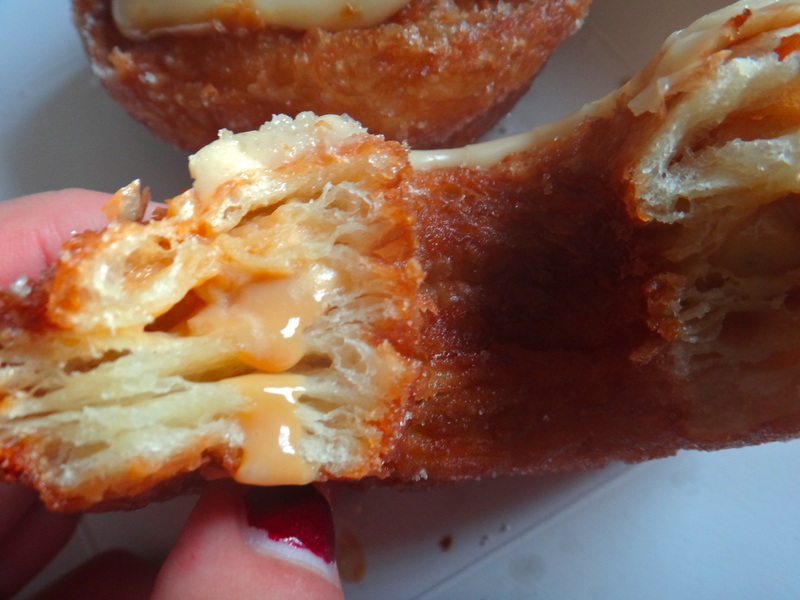 Here it was crunchy but not greasy and you could tell it had just left the fryer. The calamari comes with cocktail sauce and aioli. Overall, we thought the food could’ve been a tad cheaper but its hard to be upset when you’re dining in such a pleasant environment. 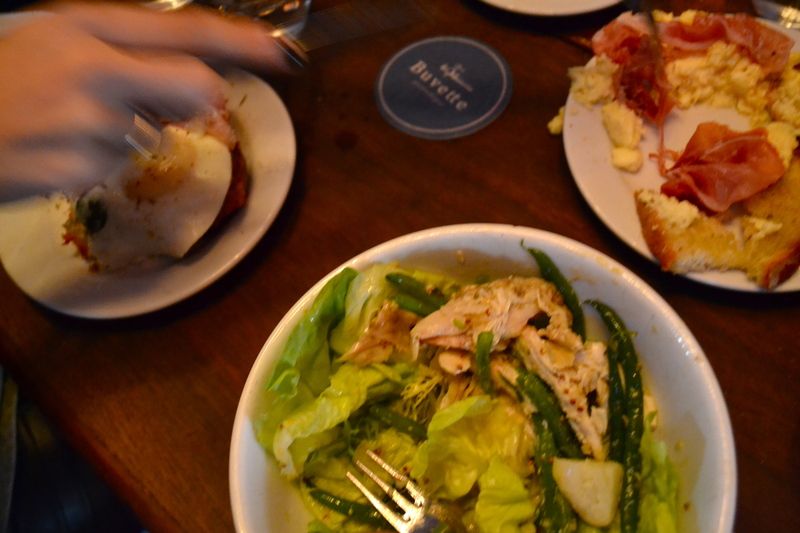 Their menu also had some really great sounding dishes like their crostini with white bean puree and roasted peppers, the brick chicken and especially the gnocchi with cream, mushrooms, and chicken. Their drinks sound good, their burger won best burger in SD at one point, and they have a $5 dollar happy hour plates special. 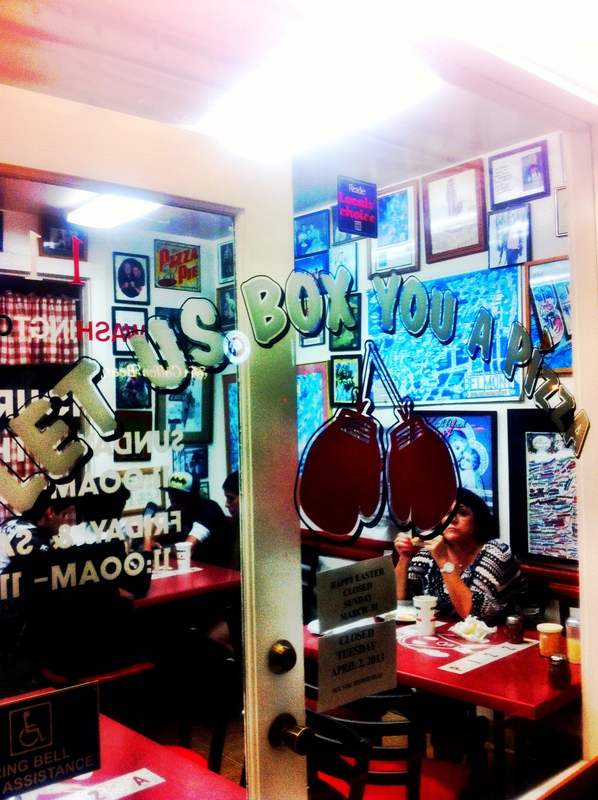 Jayne’s: We will be back.